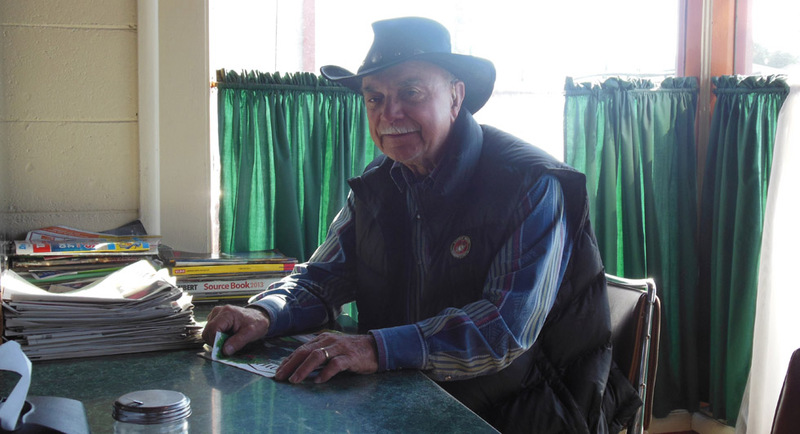 On March 8, 2008, friends and family met at the Country Club Bar & Grill in Klamath, California to celebrate the life of Hank Hilton. 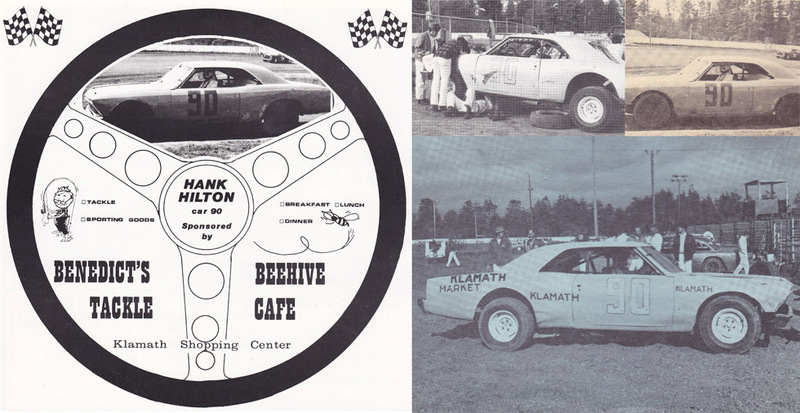 Old silent films from the 1950’s Devil’s Thrill Show which starred Hank projected on the wall while “Roadhouse Blues” played on the jukebox. 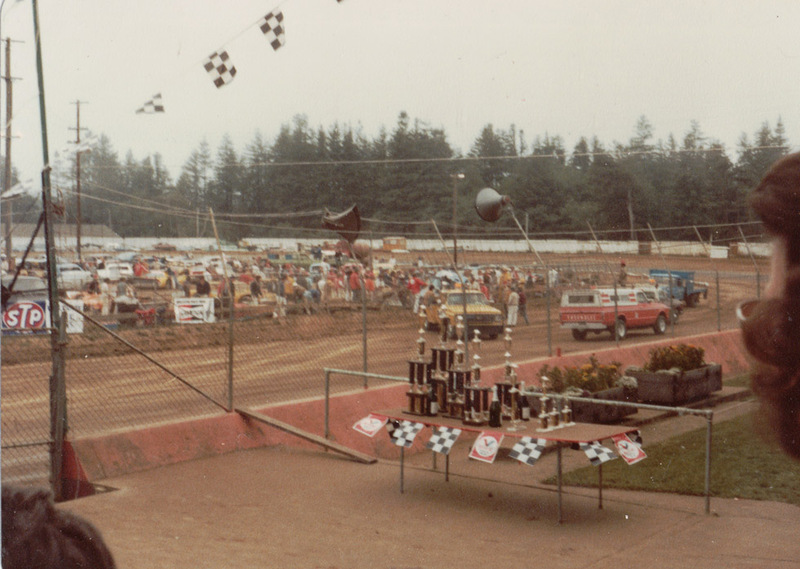 A table displayed photos of Hank from throughout his life and at the center a trophy he won as the Redwood Acres Raceway Track Champion of 1982. 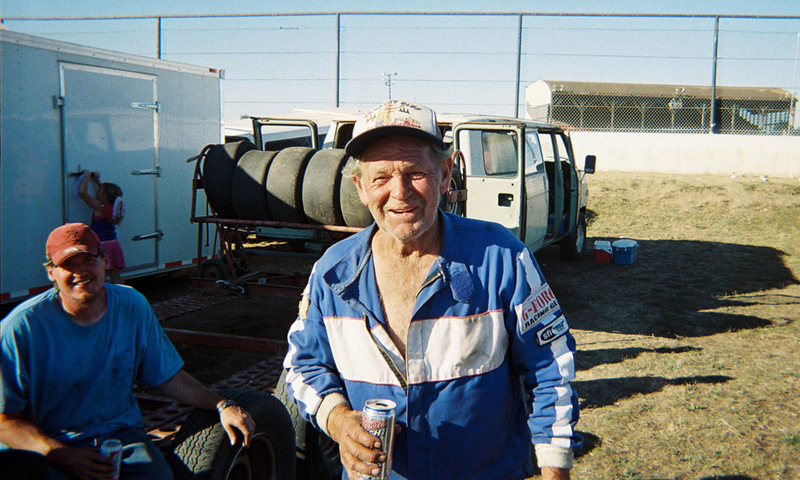 Beer bottles were raised as stories of Hammerin’ Hank filled the room; about how he began racing at Slauson Speedway in Los Angeles at 16, how he raced on Enderts Beach in Crescent City, and how he was still racing in 2007 in the North State Challenge Series at the age of 74. 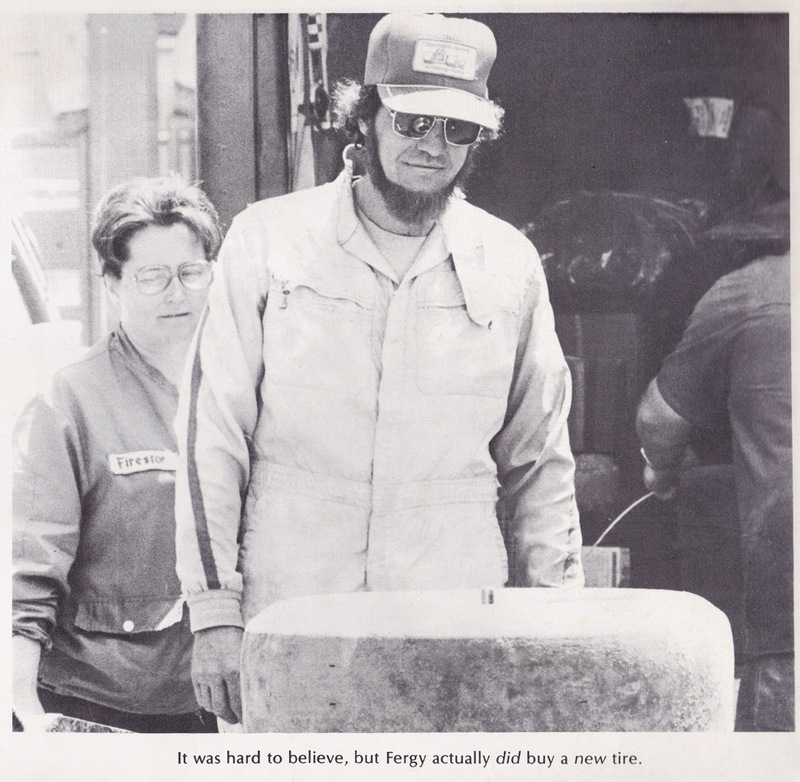 About how he ‘turned his own wrenches’, and how in later years could use his walking cane to clear personal space around the garage or break up a fight in the bar. 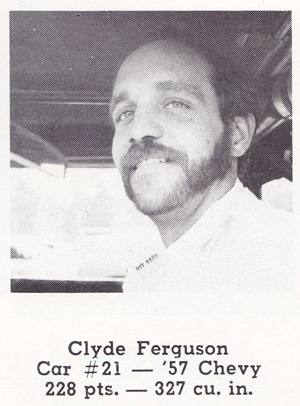 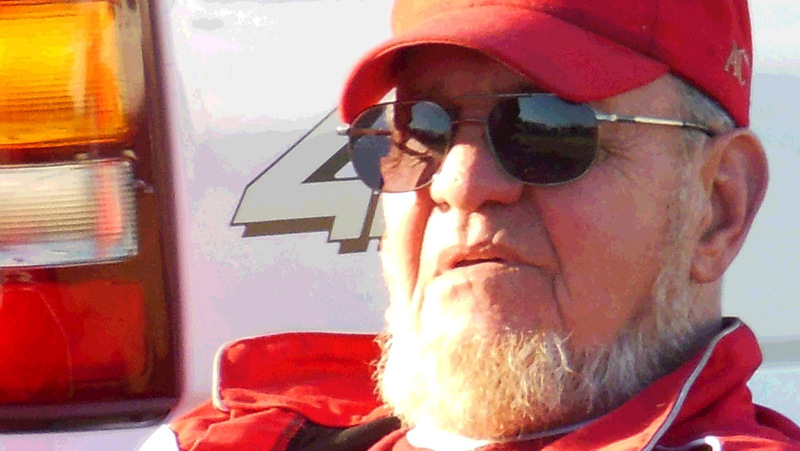 Drivers young and old referred to him as both tough and a father figure. 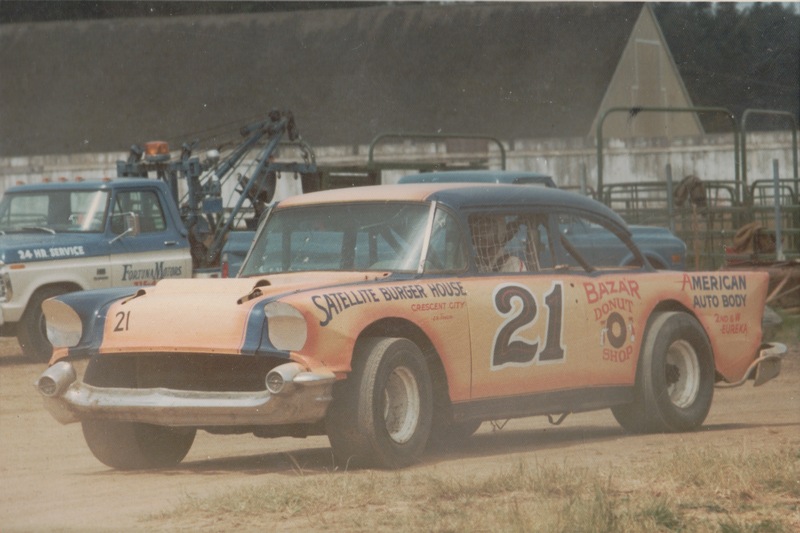 Born July 2nd 1933, he had passed away on February 28th, 2008 after a battle with lung cancer, before his 60th anniversary of racing. 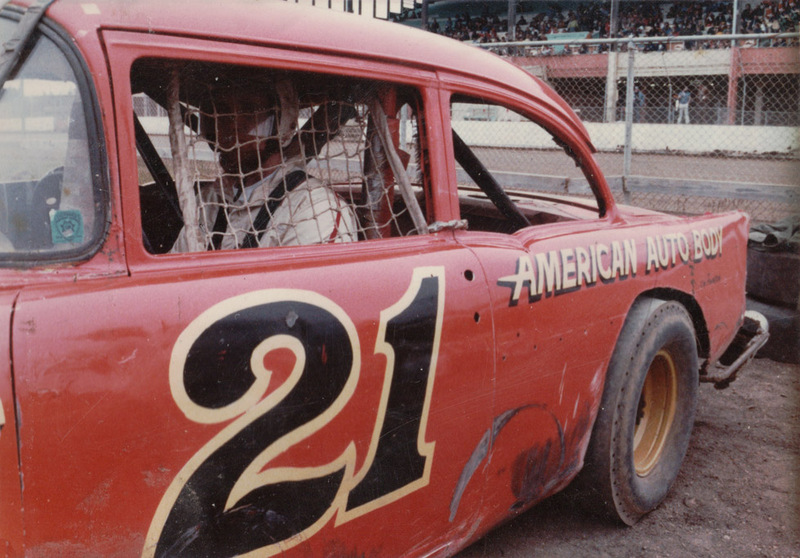 In the 1950s Hank raced the the rugged dirt track known as Slauson Speedway in Los Angeles. 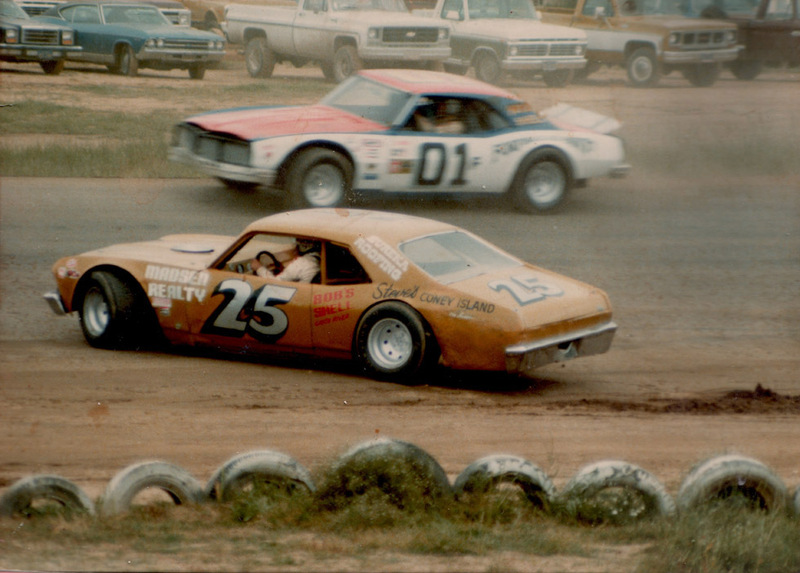 Though much of the film footage has been lost to deterioration, you can still see the jalopies bouncing through the spine-jarring ruts and at the finish line going either high or low to avoid a car-swallower of a puddle. 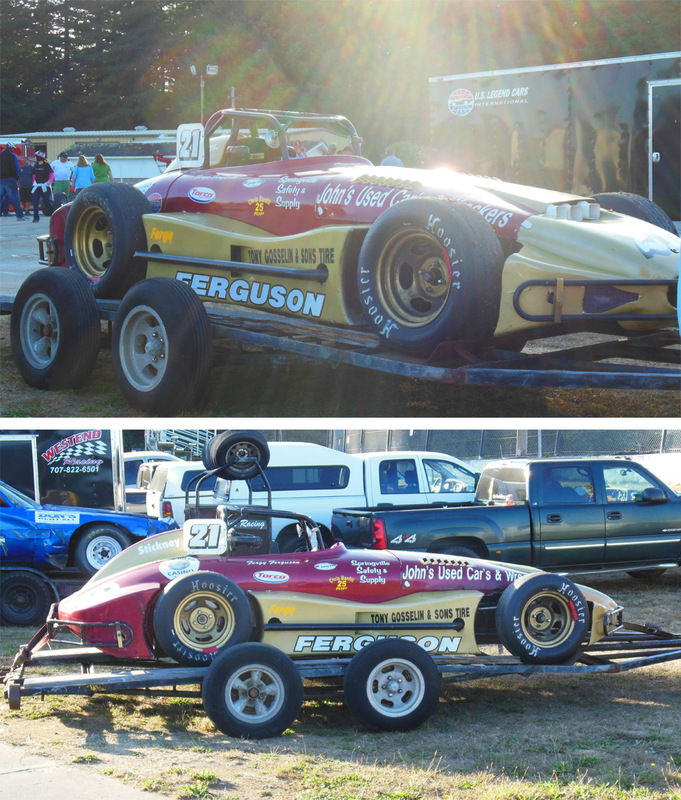 It was more like an off-road endurance test than a race around a track. 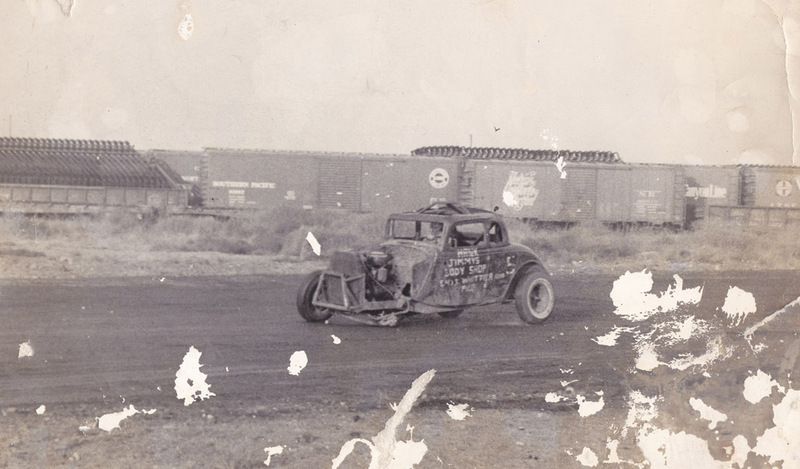 The craziest stunt had to come in 1956 with the Chuck Casteel Hell Drivers Thrill Show featuring Hank Hilton’s Death Leap, where Hank did the Fire-Wall Crash while riding on the hood of a ’51 Hudson. 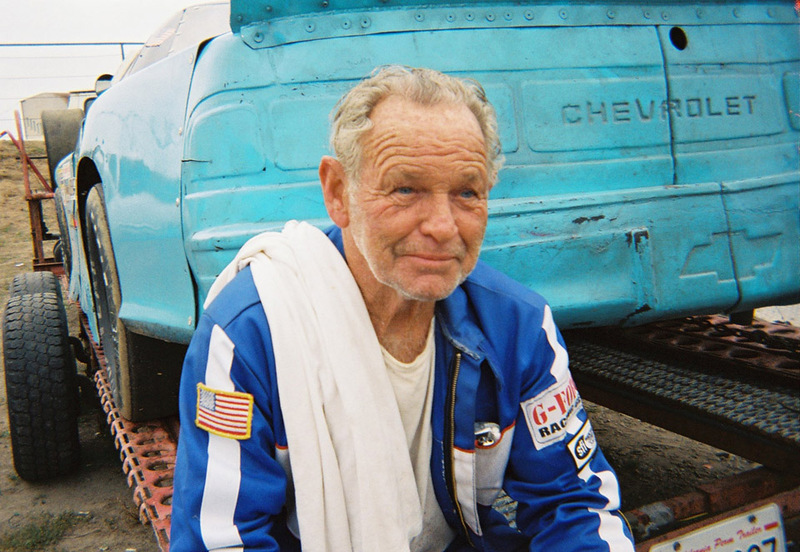 In the old film Hank is shown in his white trousers spread eagle on the hood of the car crashing through a wall of flame, then jumping off to the ground as the others ran in to check on him. 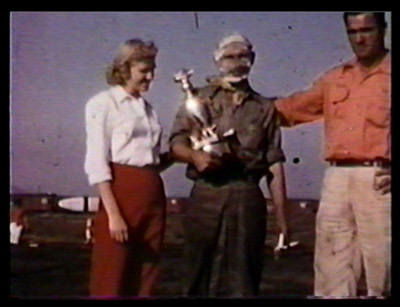 Delores described the events: “He was on the hood of the car and the wall was on fire and all was well….but they had put tar paper in the wall and it stuck to his face giving him third degree burns.” The film shows him returning later with a face covered in bandages to accept a trophy and consoling pats on the back. 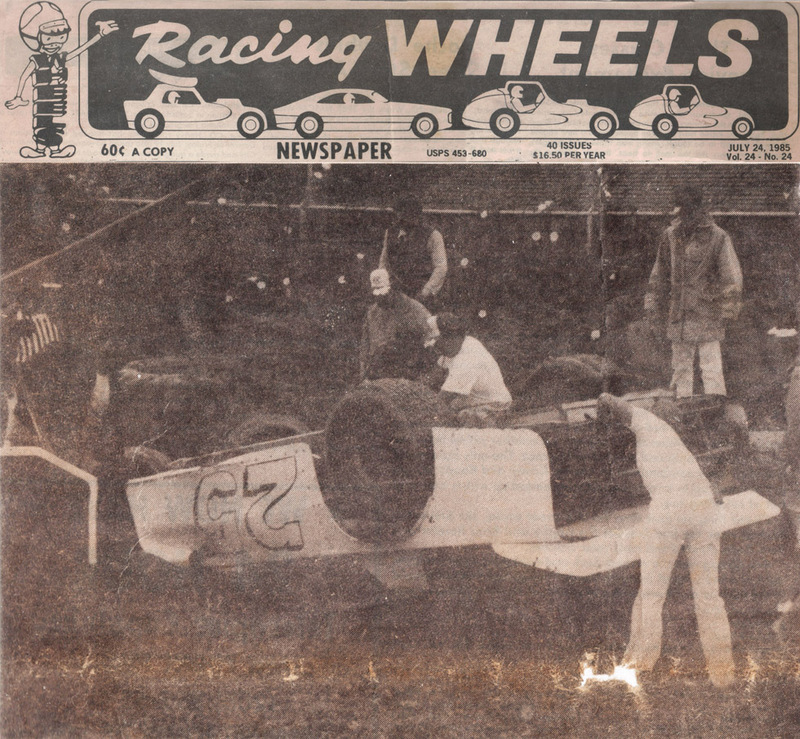 This would not be the first injury from his daredevil lifestyle, nor the last (see A LIFE IN RACING). 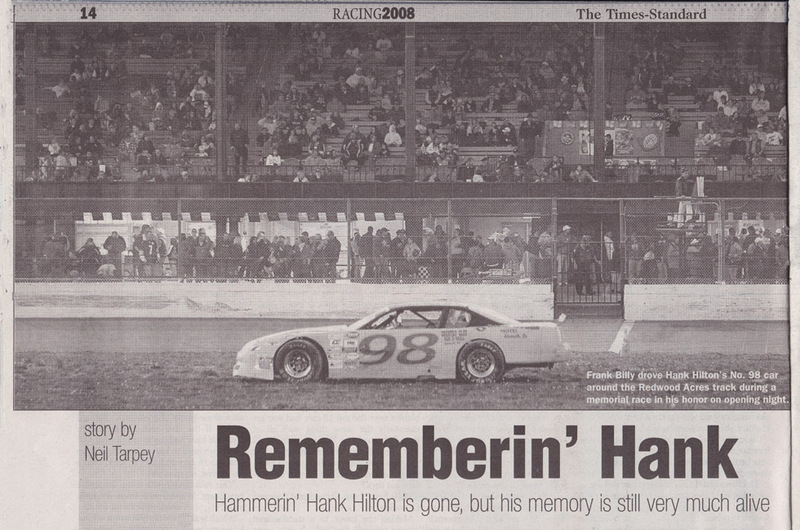 Hank would still always remain a racer. 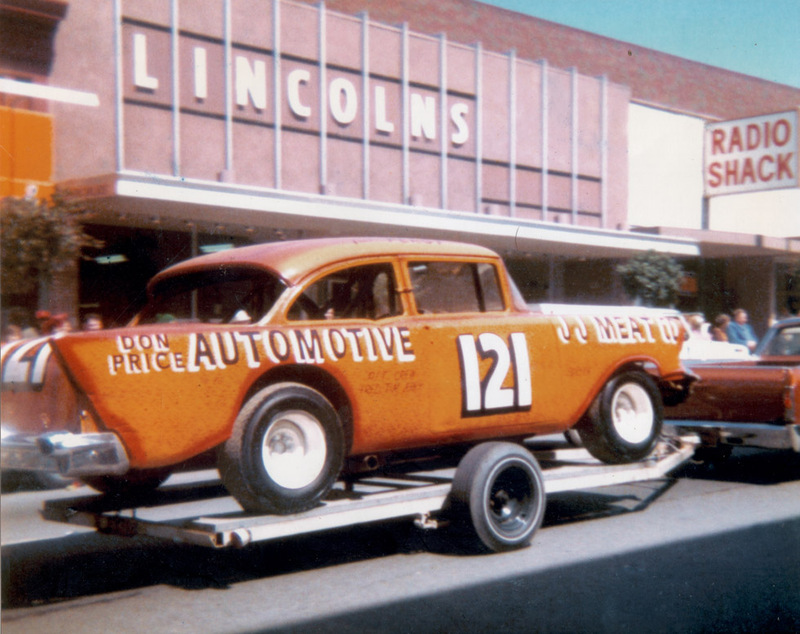 Throughout the 1950s in Southern California at tracks like Riverside and Ascot, Hank competed with big names including Lee Petty and Parnelli Jones, and raced and won in NASCAR Grand National late models. 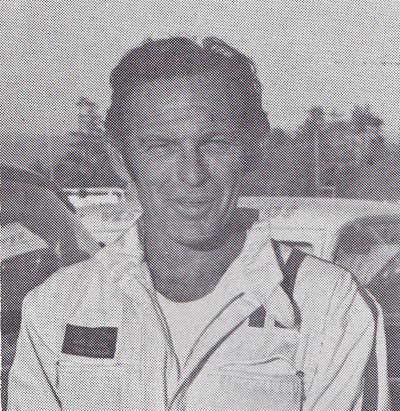 In 1957 he had a driver’s test with American racing legend Dan Gurney and won a seat in an open wheel Grand Prix type car, competing in a 500 mile race at Willow Springs, finishing 2nd in a car built by George Hulman, son of the owner of the Indianapolis Motor Speedway. 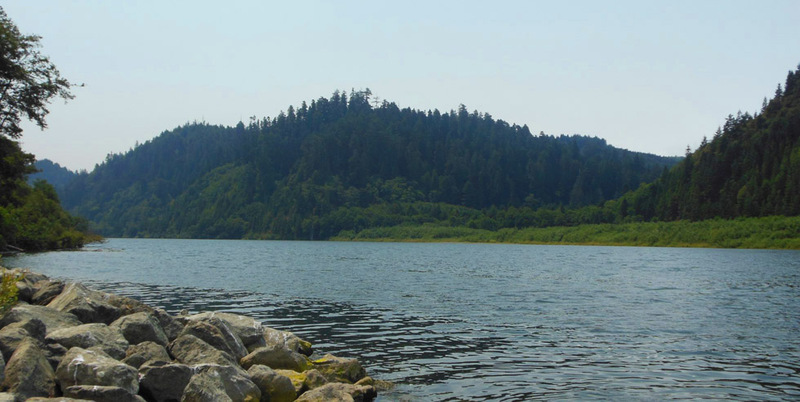 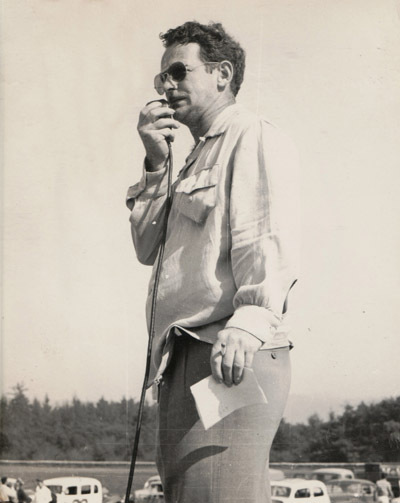 Moving back to the north coast for the health of his son, he lived in Loleta before settling in Klamath in the Yurok Indian Reservation on the Klamath River. 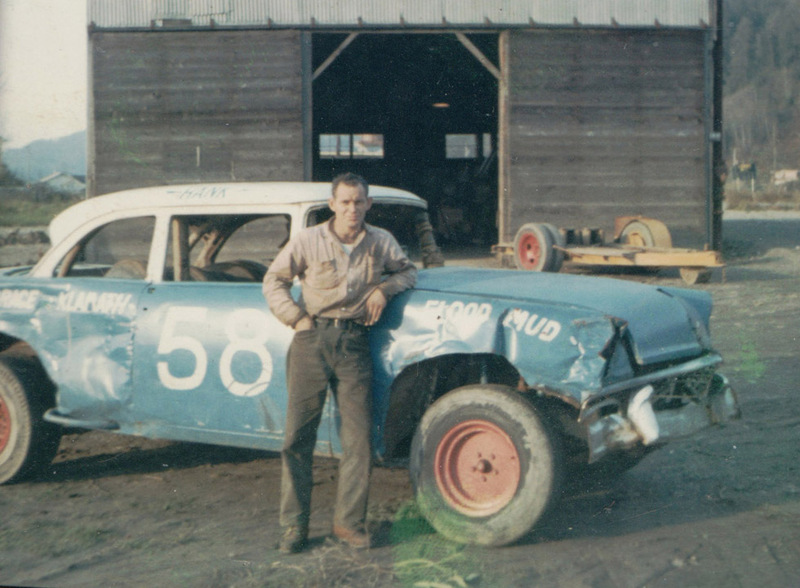 The 1964 flood which destroyed the town center also dragged his Ford through the mud. 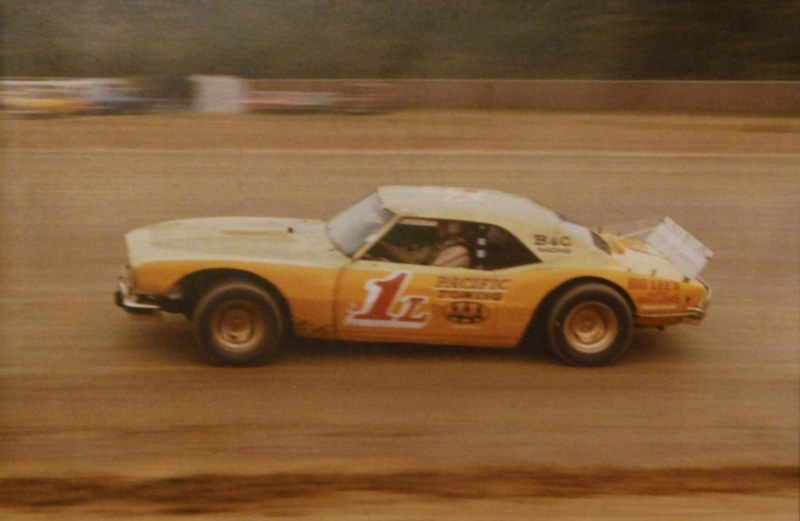 He resurrected it as a race car calling it ‘Flood Mud’ and took it to the track in Eureka. 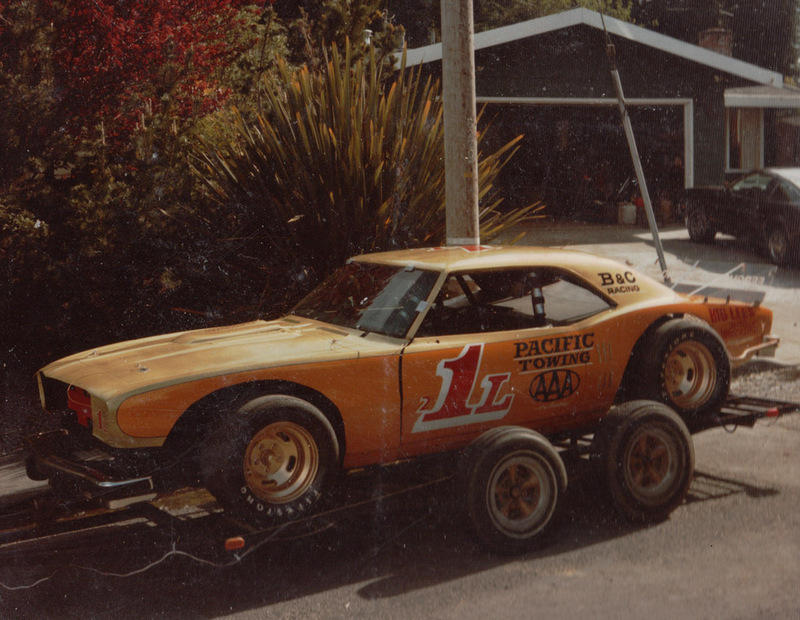 Hank would race all over California, Oregon and Nevada, but his home track would become Redwood Acres. 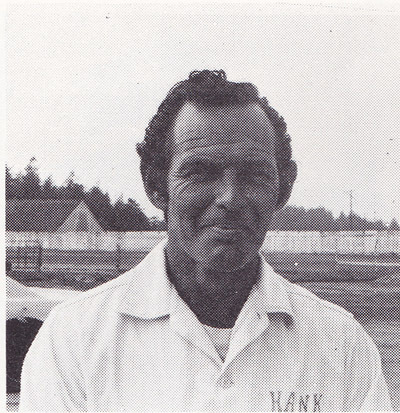 In a 1973 profile in the Redwood Acres Raceway program The Stock Report, Hank was asked why he raced, and he replied: “Why breathe? 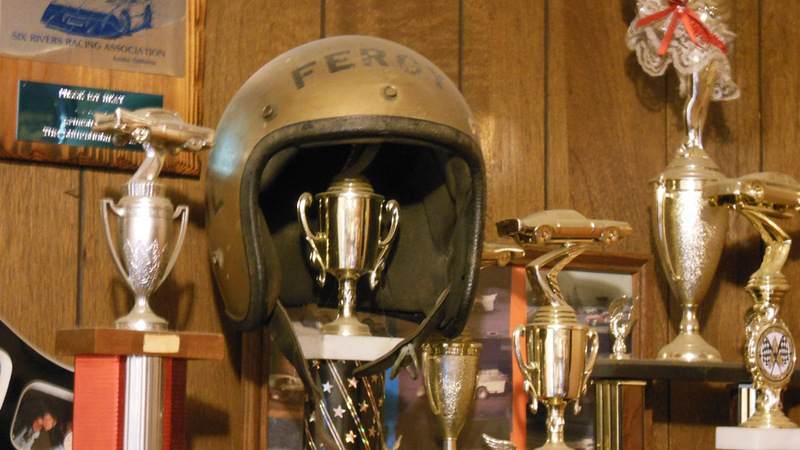 In my blood…competition.” Already a winner of 300 trophies at the time, he said his favorite was when he set the World Record for height and distance over parked cars in a non-modiﬁed production car. 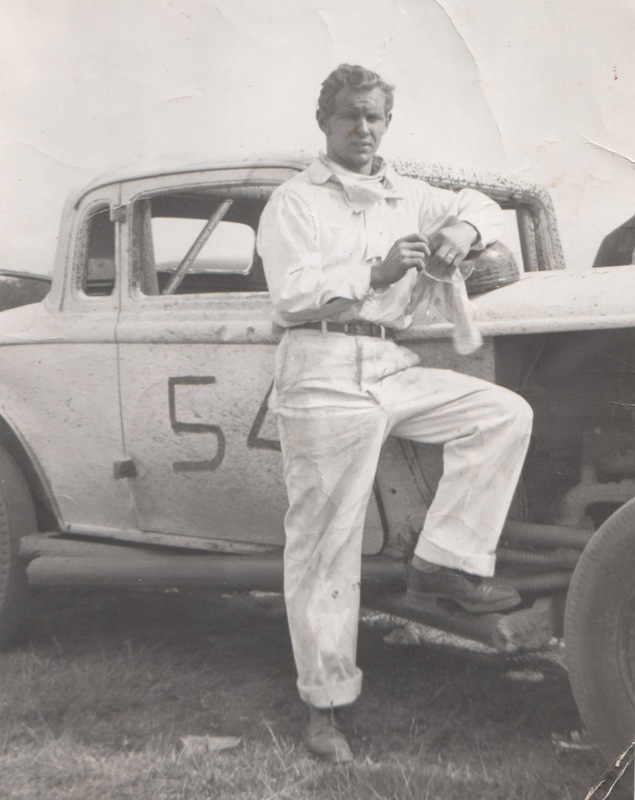 His advice to someone who had just bought a race car was “Not to try too hard, race to finish, and then race to win. 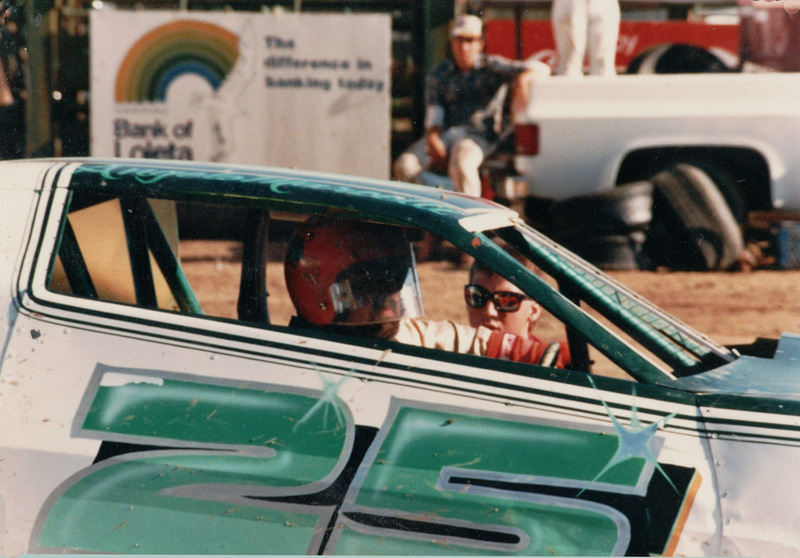 To be a winner you have to work hard, pay attention to what the other drivers are doing, and race clean. 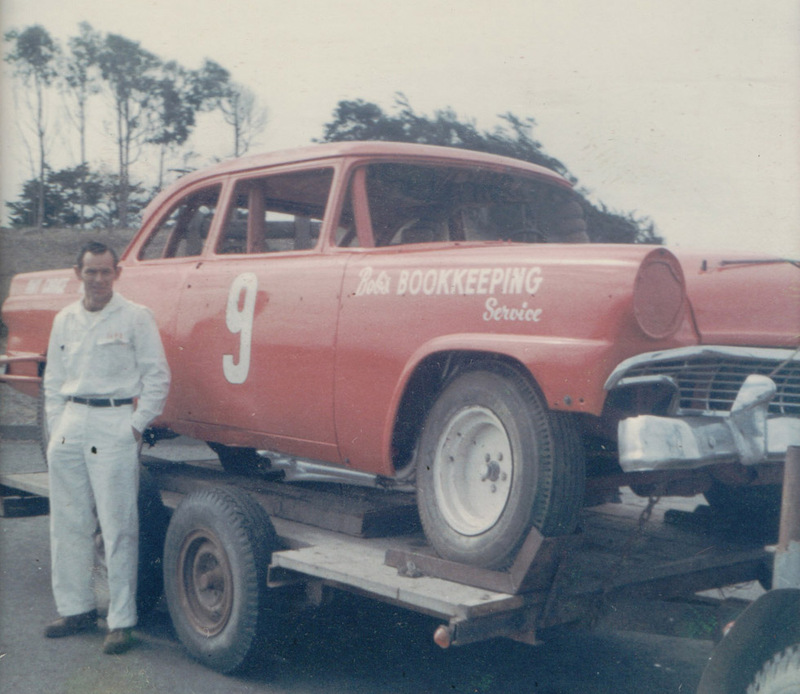 Good reflexes, foresight, and guts are what it takes.” He added that racing for fun was his only goal and to keep driving as long as he could afford it. 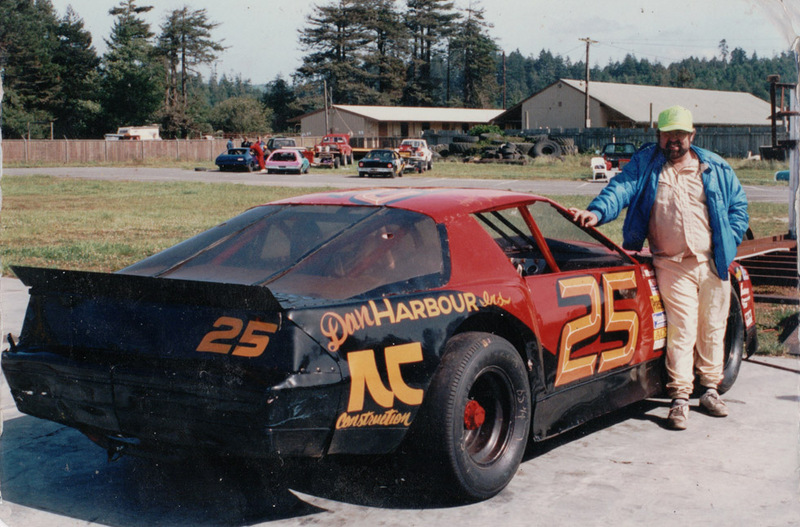 Hank would still be racing nearly 35 years later. 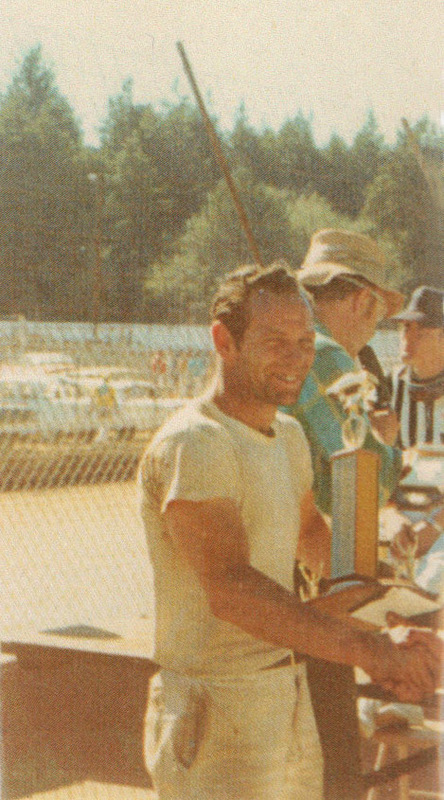 Hank winning another trophy at Redwood Acres, early 1970s. 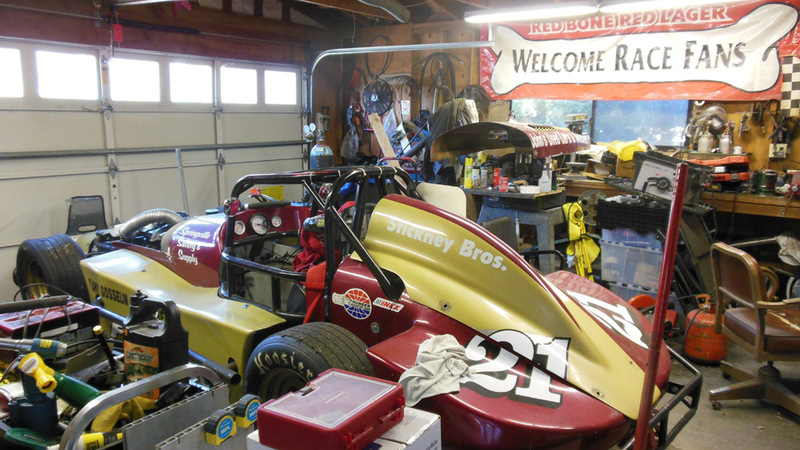 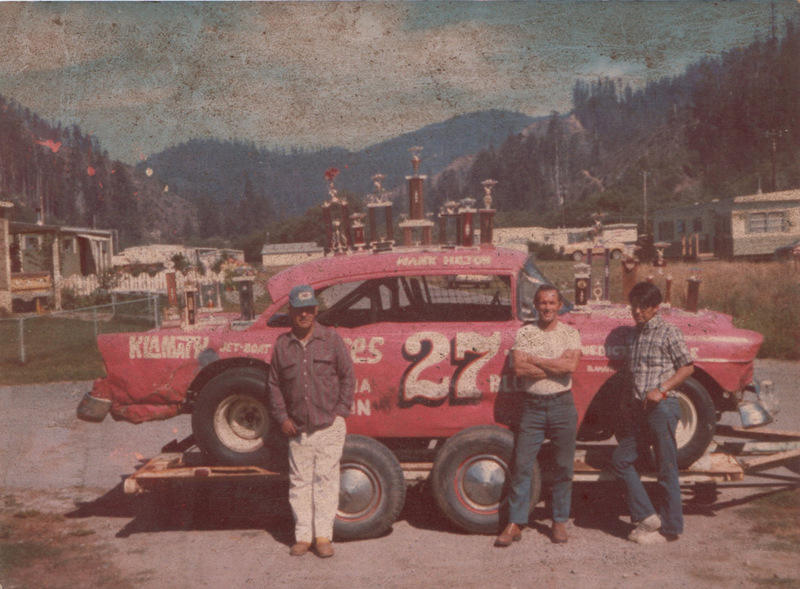 As with Ferndale’s farmers, the Klamath/Crescent City contingent of racers made their mark on Redwood Acres in the 70s. 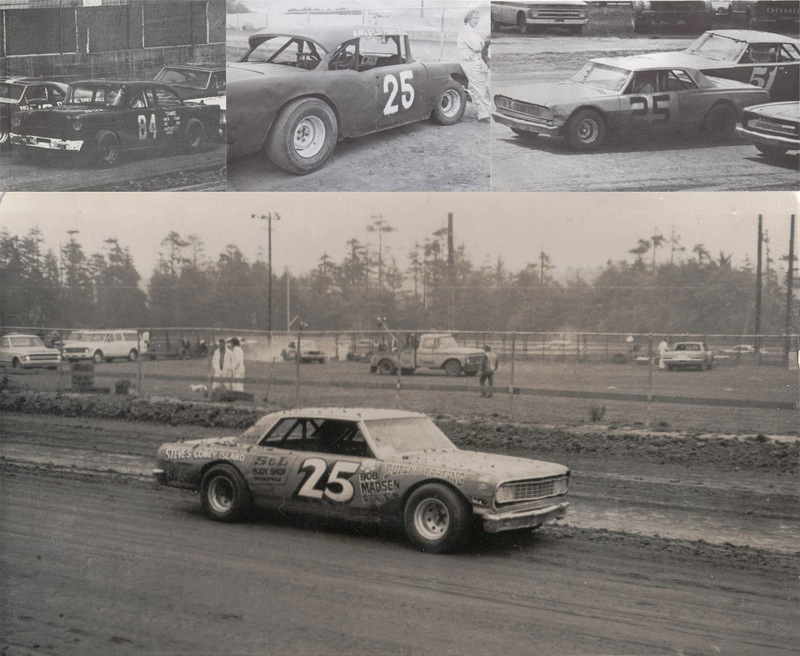 Known as The River Rats, they included Joe Wilson, Vestel Skaggs, Jim Mostovoy and Ken Woods, all having trademark yellow cars. 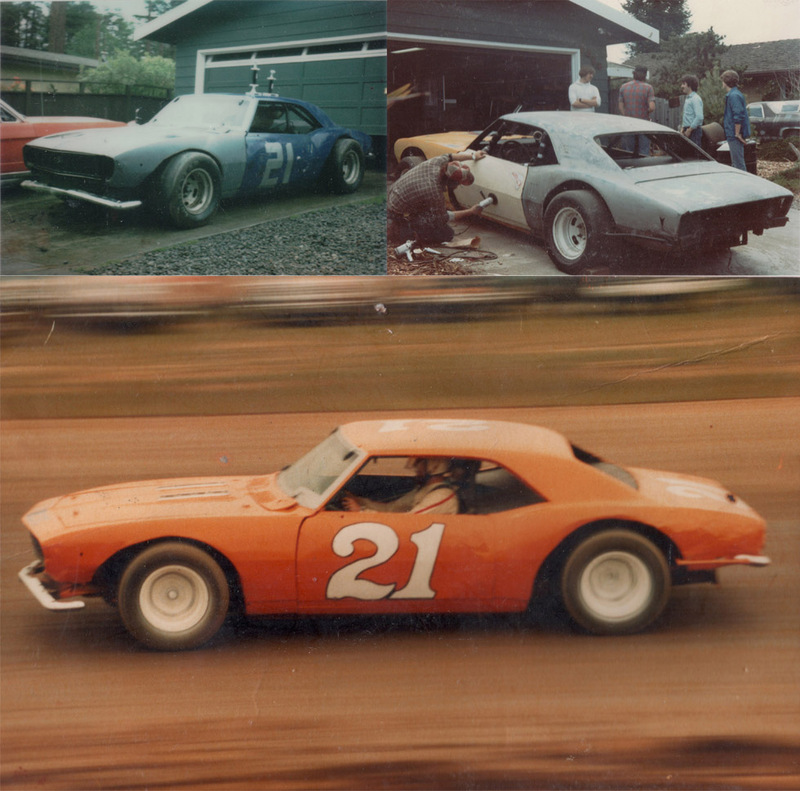 (Hank had his own car separate from the Rats, the red #27.) 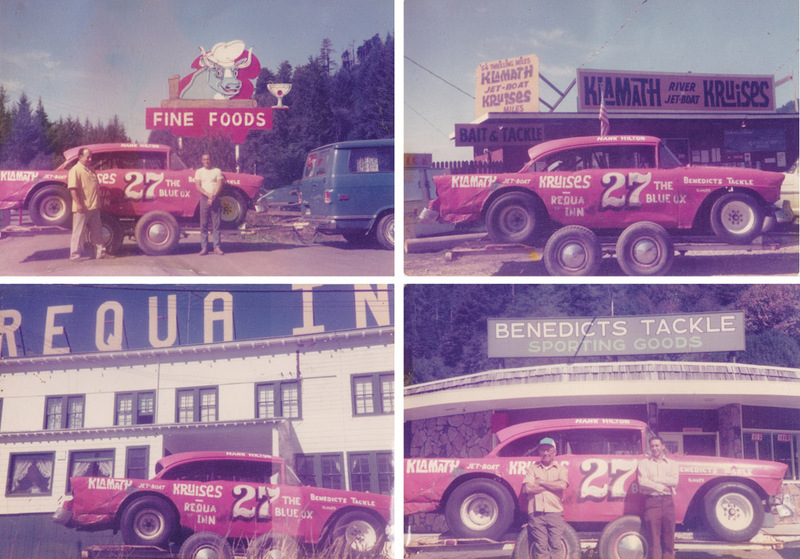 They were named after a bar “The River Runt” which was located where the vista turnout is today on Requa Road above the mouth of the Klamath River. 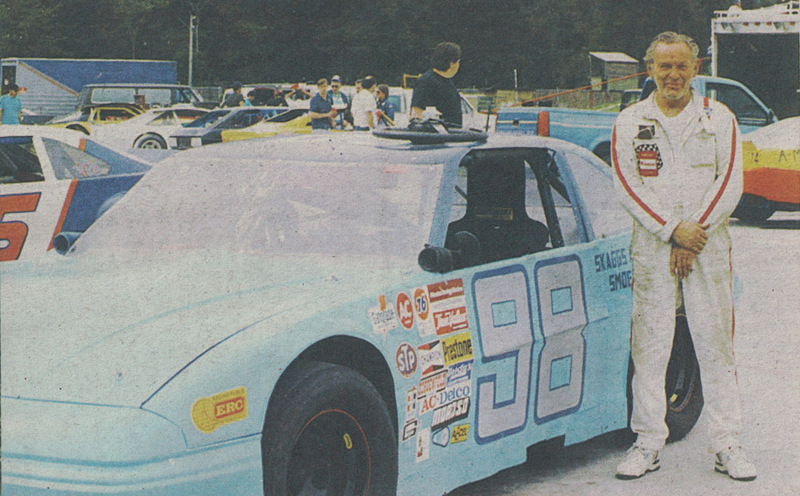 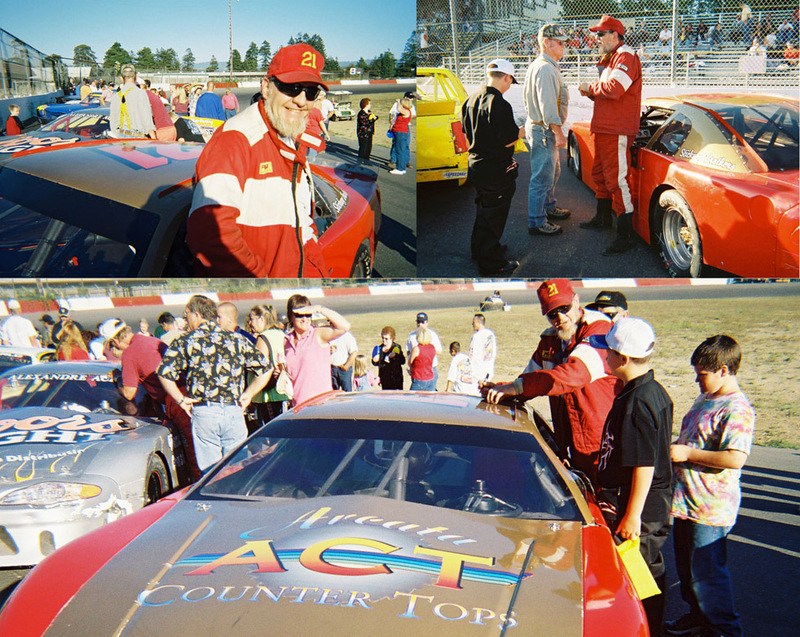 Hank was a mentor to many younger racers, from the early days in Los Angeles with the youth group The Black Knights, into his later years with drivers like touring Late Model champion Howard Ford of Crescent City, who spoke at the Country Club in 2008 about how Hank was like a father to him. 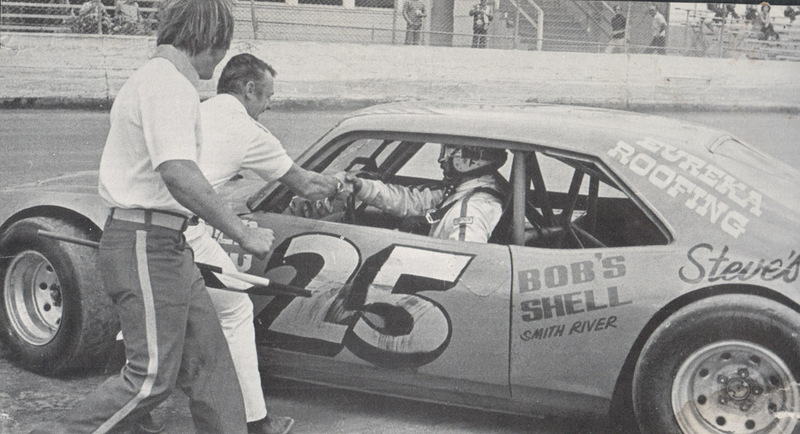 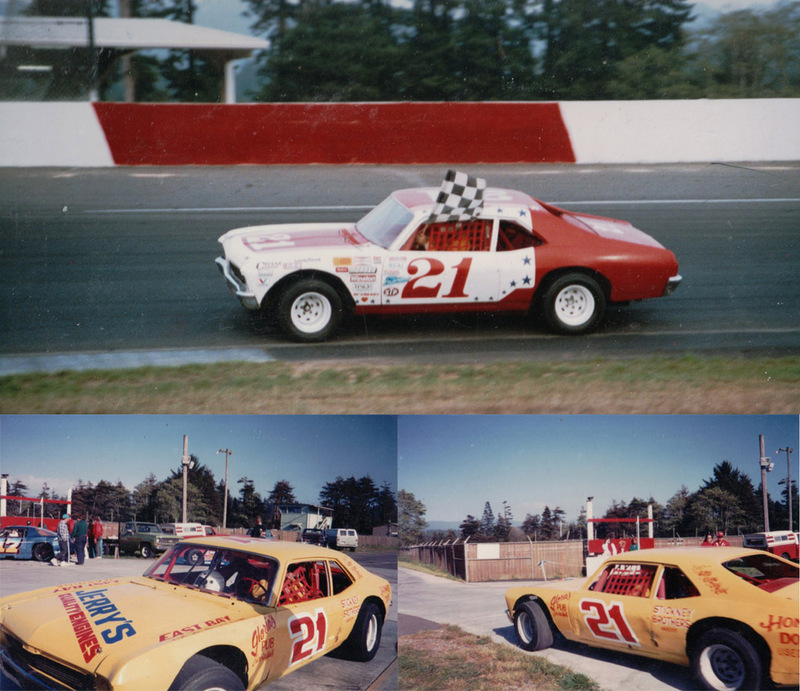 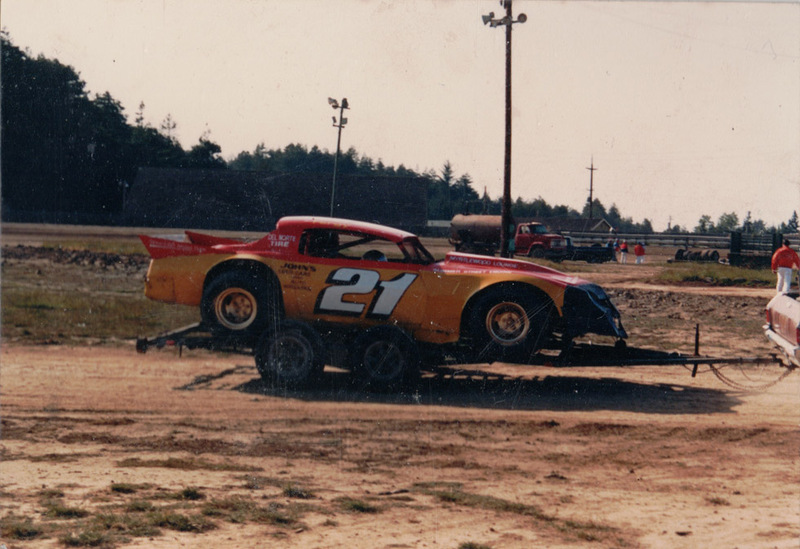 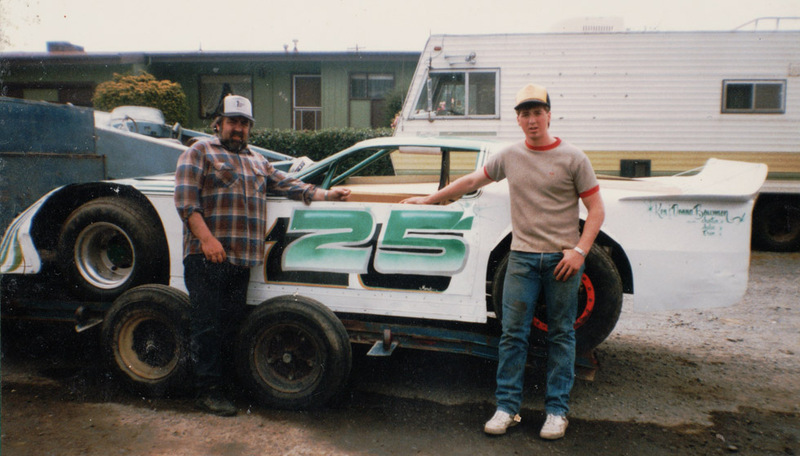 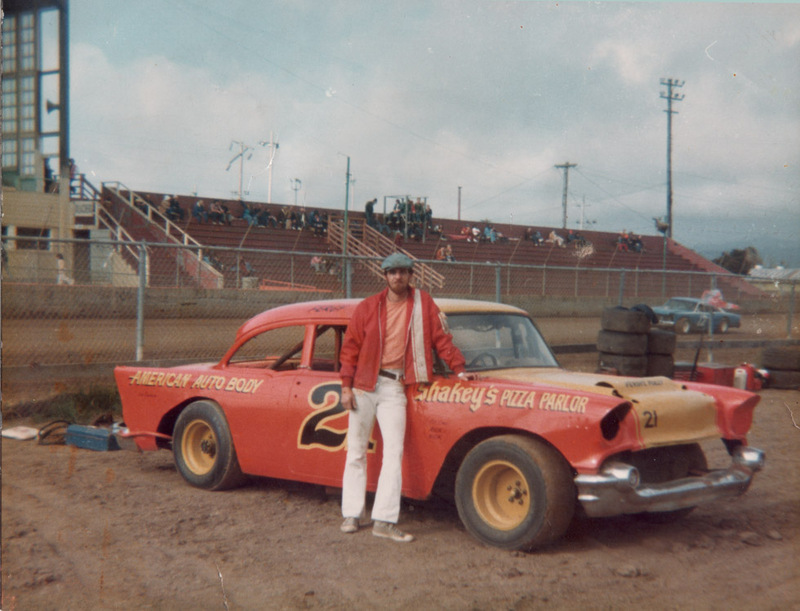 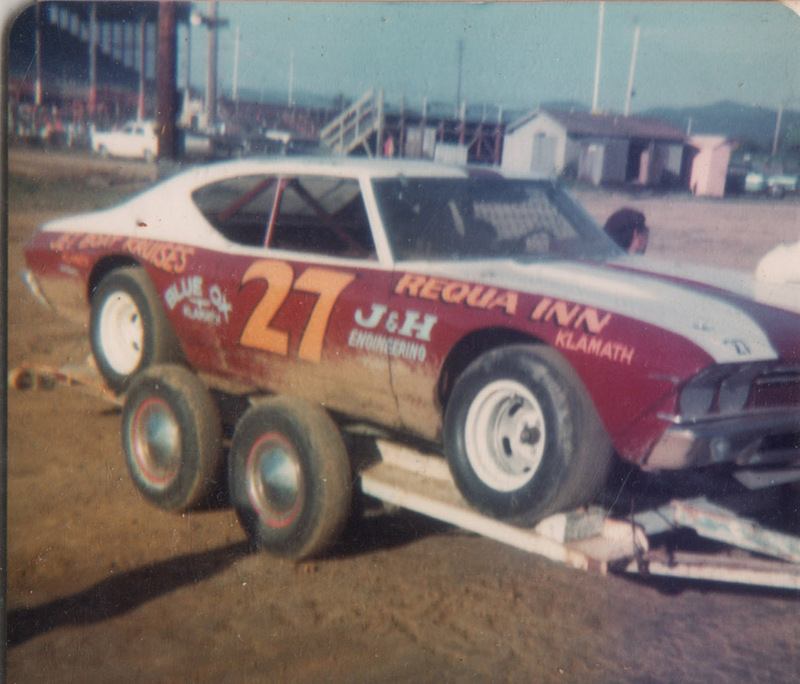 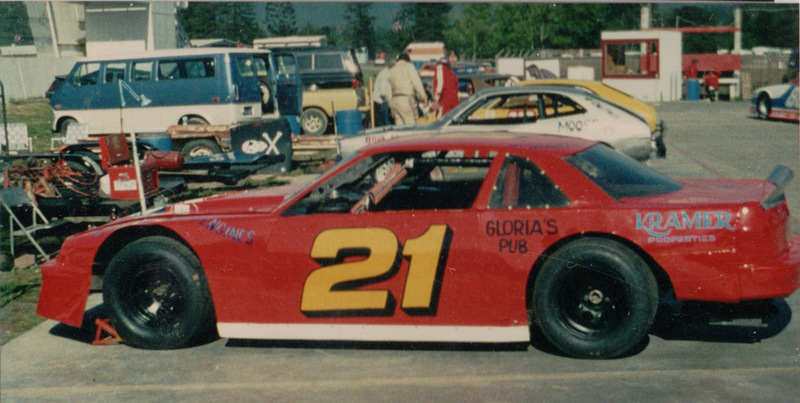 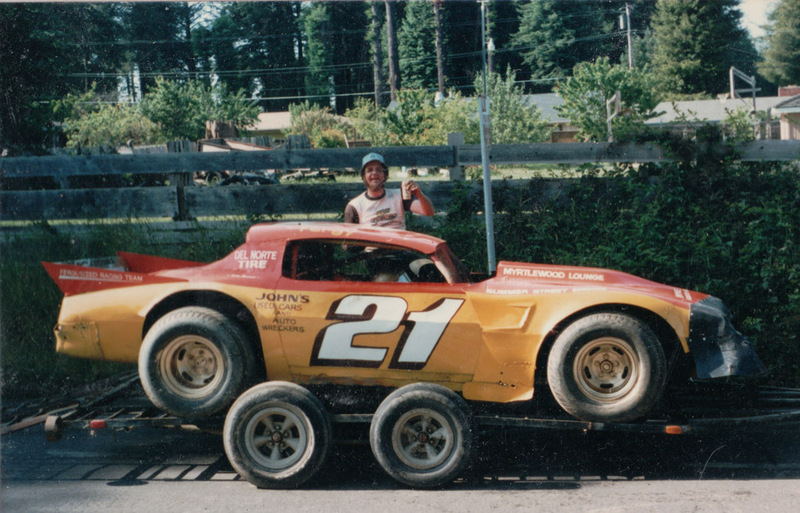 Hank arrived late for the 1976 season at Redwood Acres with a new car, still the #27 but now on the side of a newer Chevelle that sported a red and white paint scheme, a car Delores Hilton says now was her favorite. 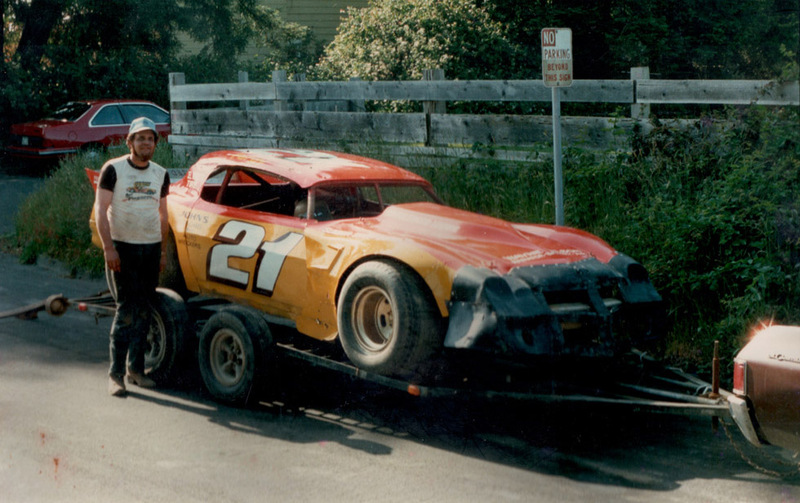 “To me that is the most beautiful car that ever was built. 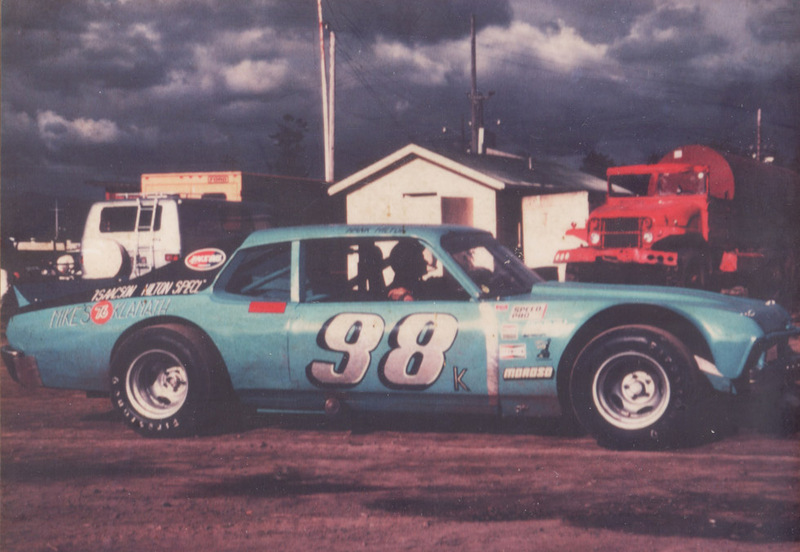 I loved the blue ones but that one I thought had class.” The car was later owned by Bert Watson who lead the points in the Super Stocks for a time with it in 1978. 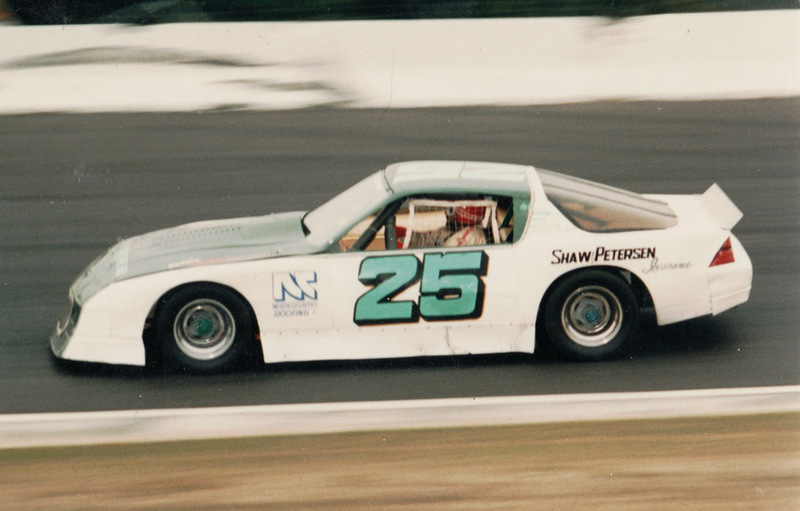 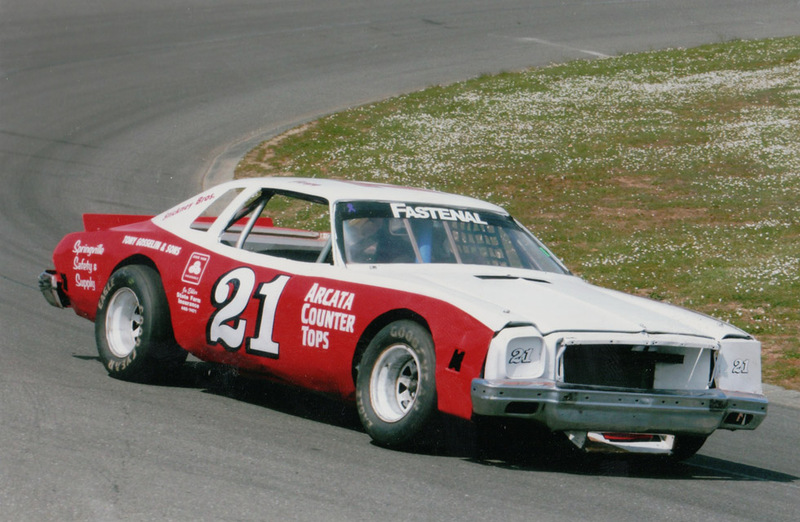 In 1979 Hank and partner Bill Isaacson bought Jimmy Walker’s ’72 Chevy Nova that he had driven in Winston West and at short tracks in ’77 and ’78. 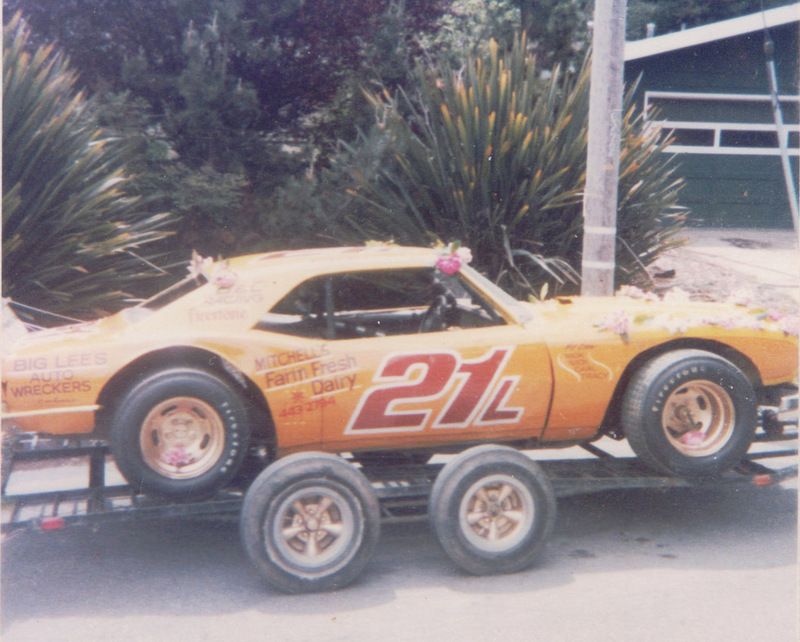 In response to Jimmy’s ‘Coffee Creek Special’ that had adorned his cars, Hank and Bill painted ‘Isaacson-Hilton Special’ on the side. 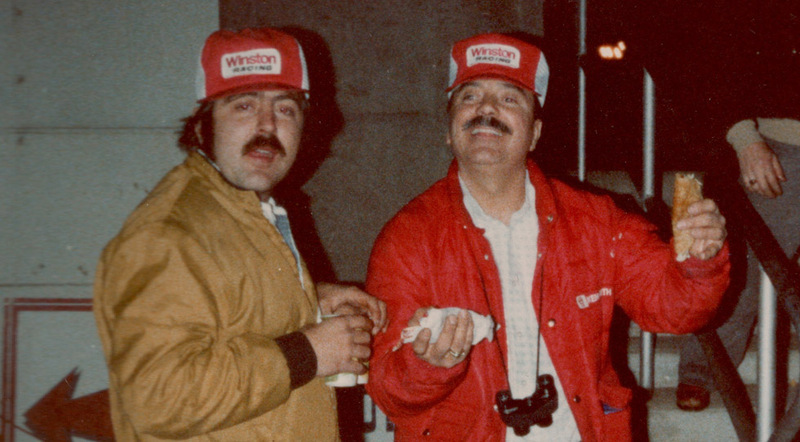 “Jim and Hank were always goofing on each other,” Delores says. 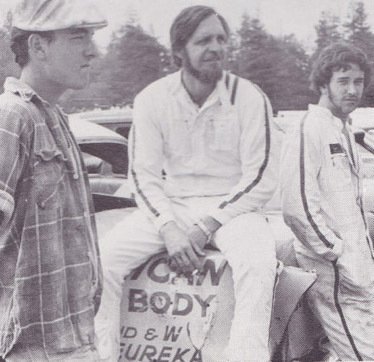 “Jimmy’s wife said ‘It’s amazing how much alike Jim and Hank are’. 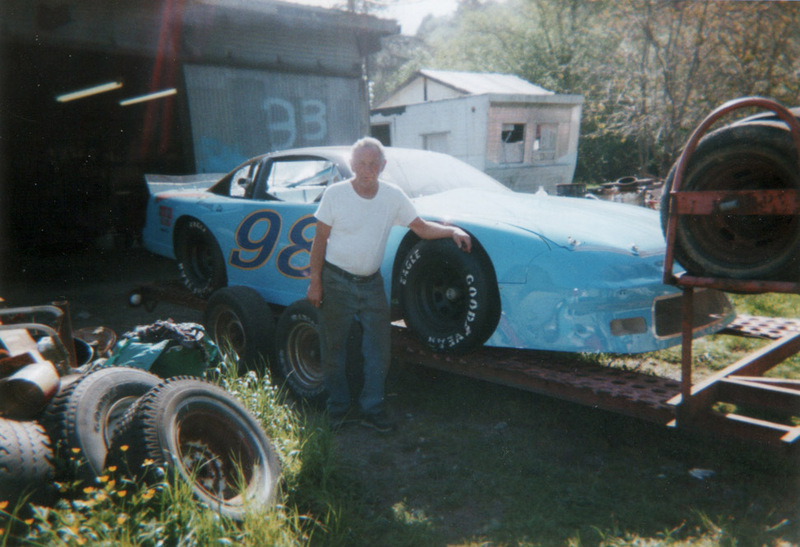 She said basically they are both the same kind of guys.” Though Hank said initially Jimmy wanted him to change the color, Hank was adamant that the color stay, and the two Petty Blue cars of the long-time friendly rivals shared the track for many years. 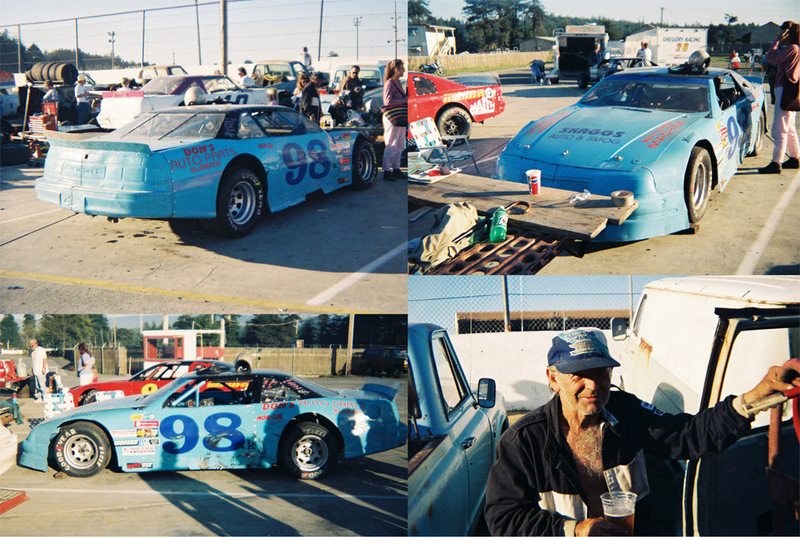 In one of his final races with Jimmy, Hank had an ill-handling car and decided to park it, and with an acknowledgement of the huge popularity of Walker at Redwood Acres, said afterward in the pits “I couldn’t keep the car straight and if I had crashed Walker and taken him out they would have strung me up!” The #98k light blue car with the dark blue top would be Hank’s signature on the track for the rest of his racing days. 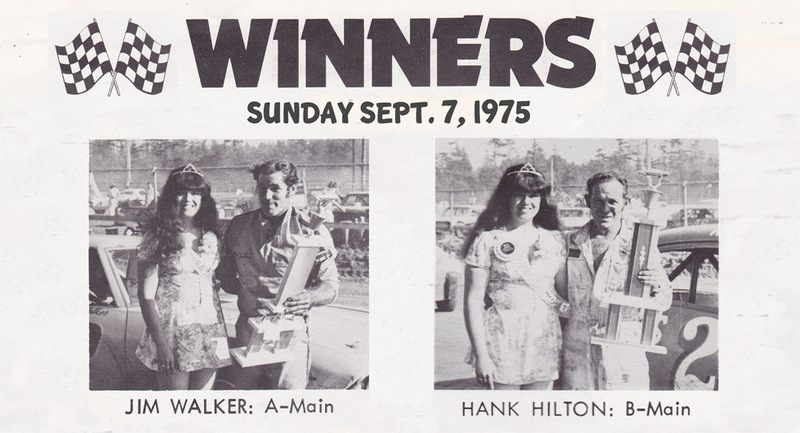 After close finishes in the Redwood Acres Super Stock final points in 1979 (3rd) and 1980 (2nd), in 1981 Hank finished the season tied for 1st with Ken Wallan at 805 points, but a tie breaker instituted after the race gave the title to Wallan and Hank was frustrated once again. 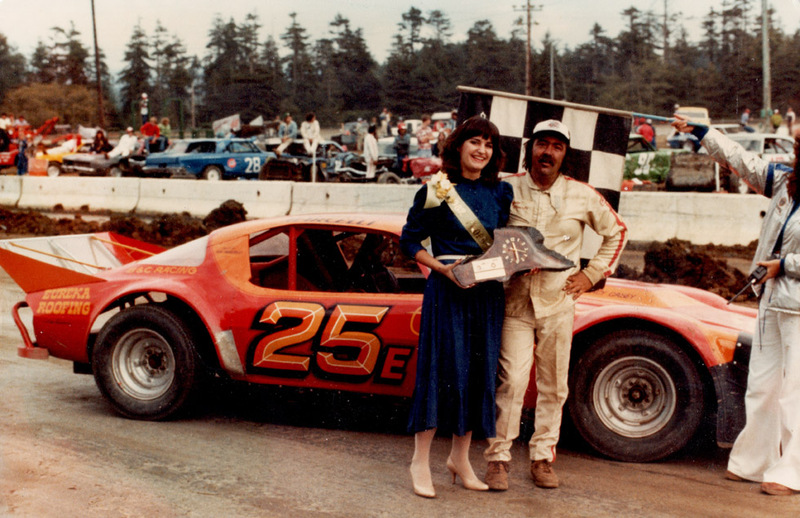 Delores Hilton says “If we had to lose it to anyone we’d want to lose it to Ken Wallan. 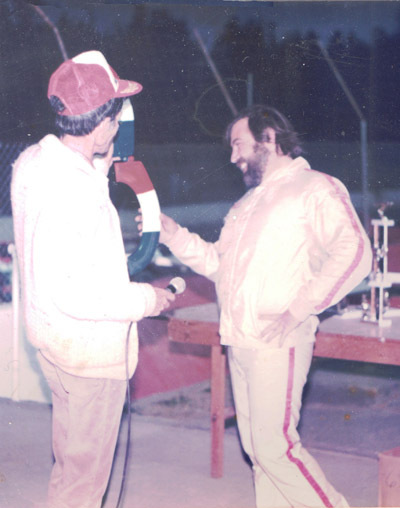 He was a nice man and we liked him a lot.” The next year Hank said in a profile piece in The Stock Report that he was more relaxed and was just trying to finish races the best he could, and would race “until they make me quit.” At the end of the 1982 season Hank was finally on top of the standings all alone, Track Champion at Redwood Acres Raceway at the age of 49. 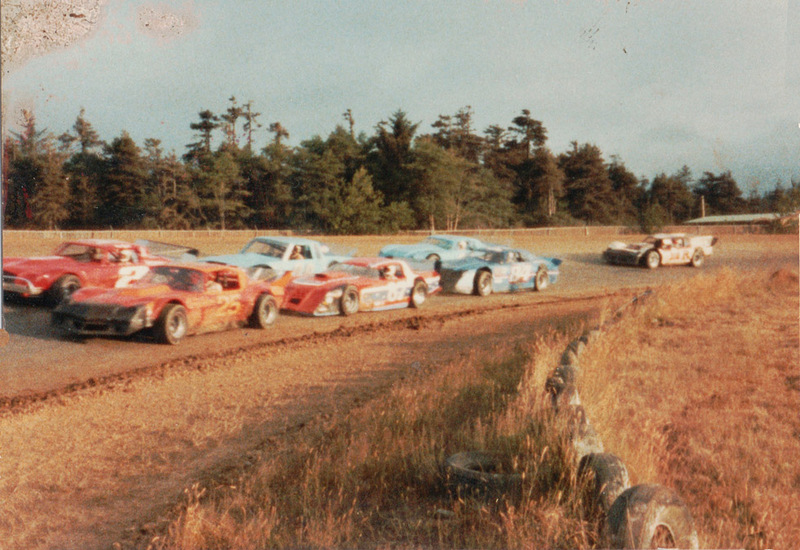 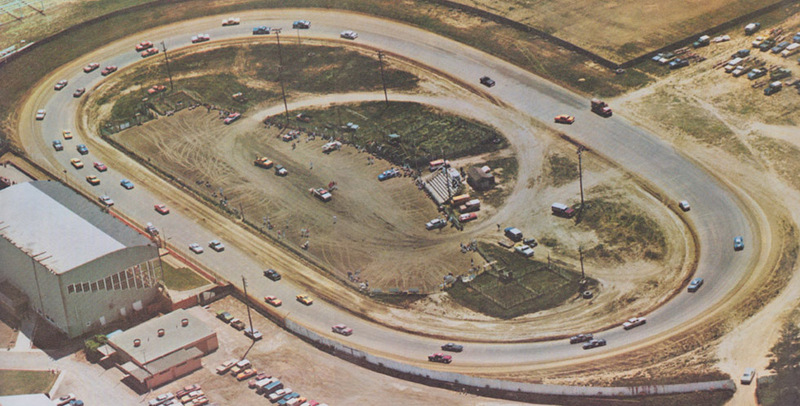 In 1988 Redwood Acres Raceway would be paved and NASCAR sanctioned, with various touring series passing through town. 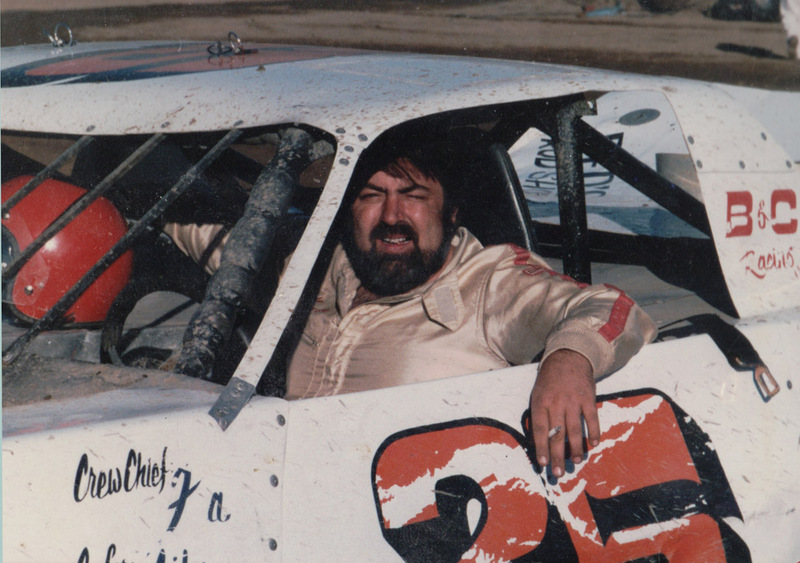 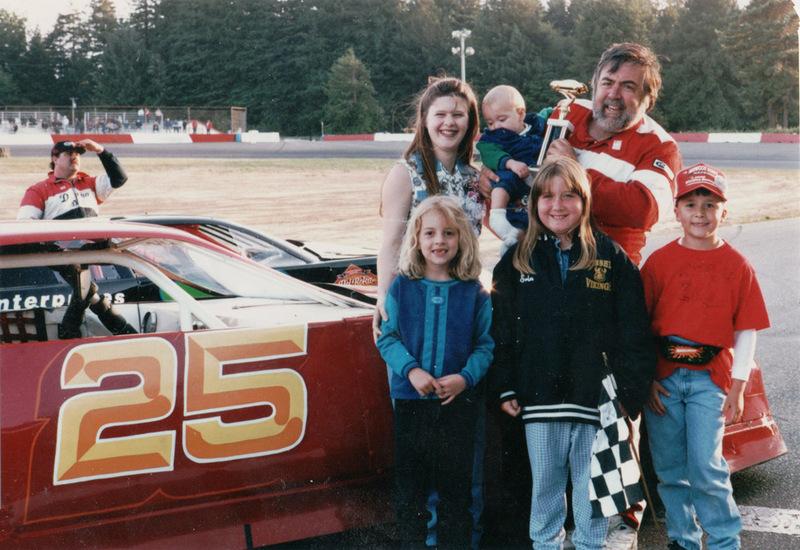 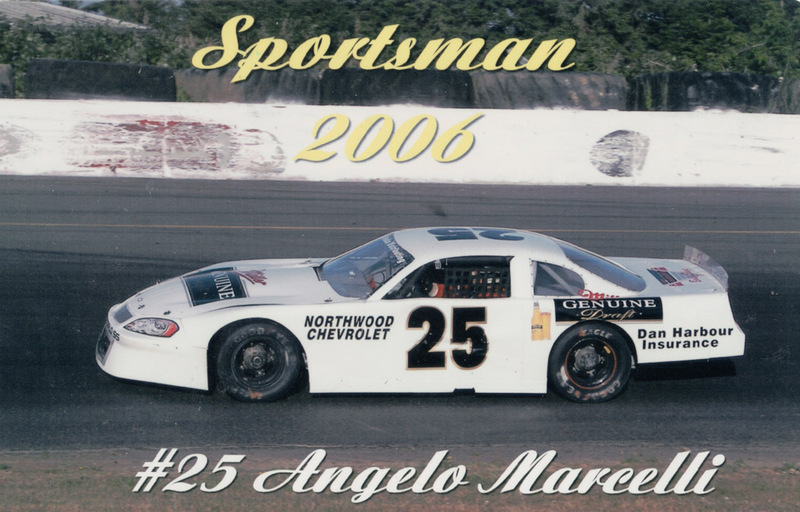 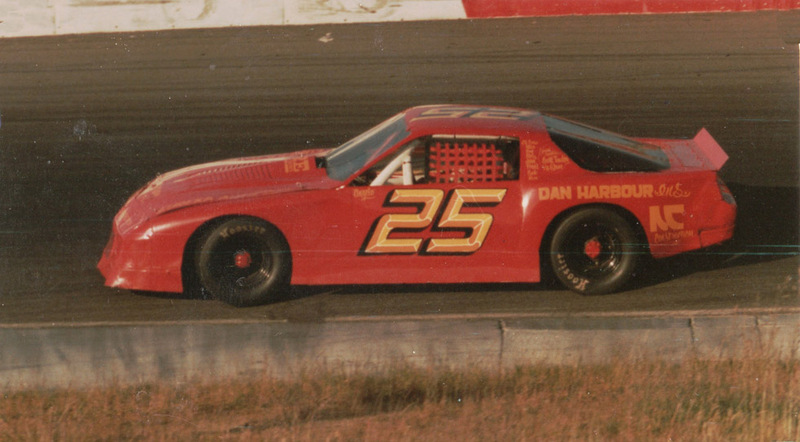 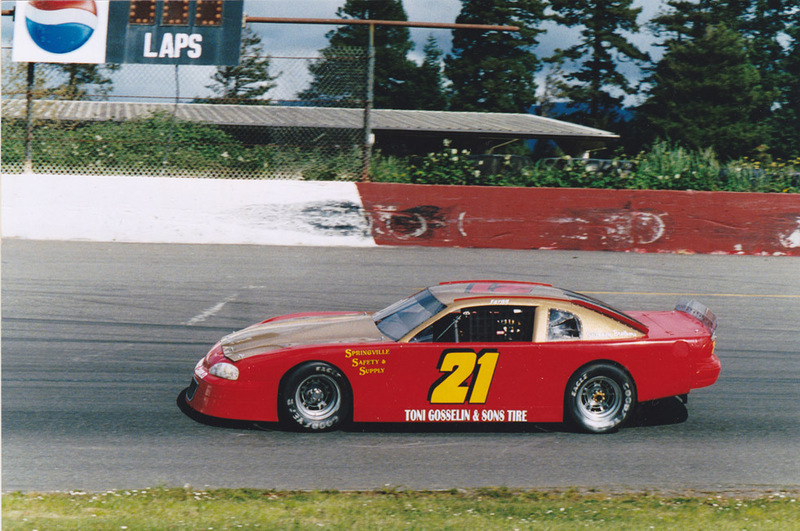 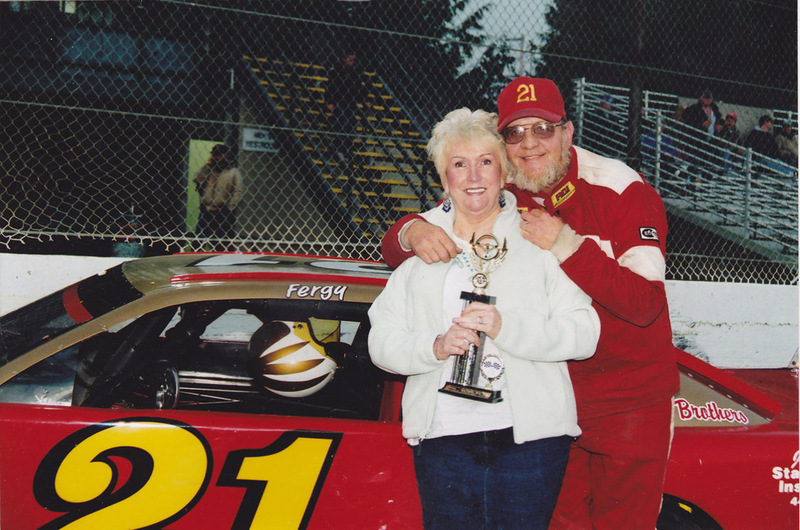 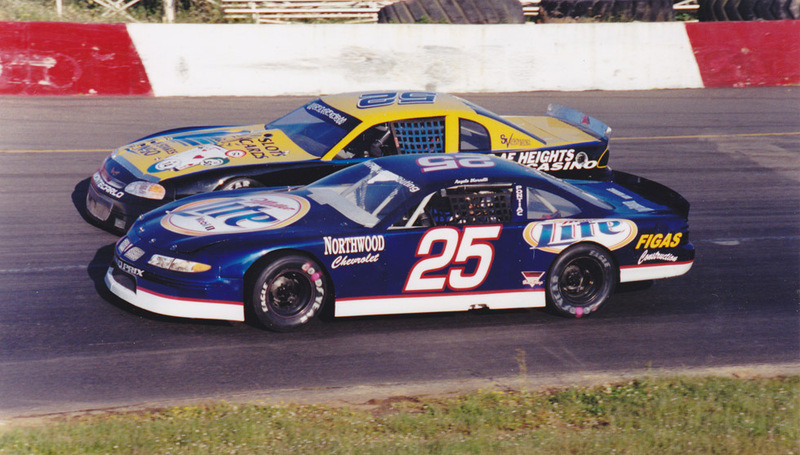 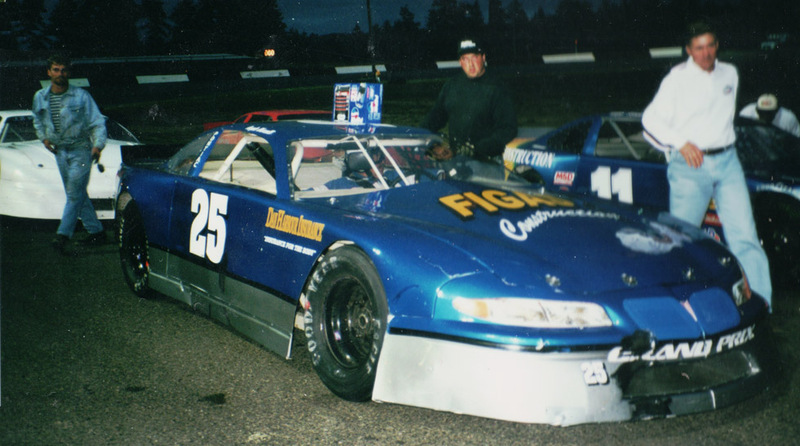 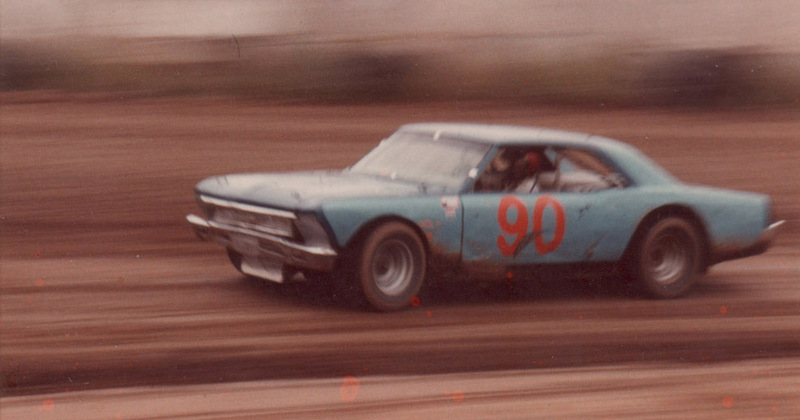 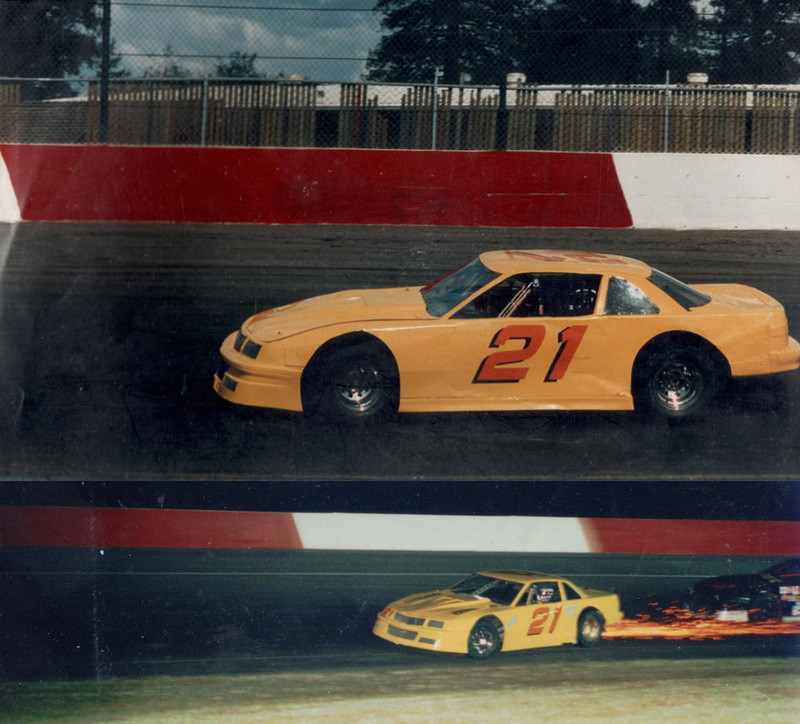 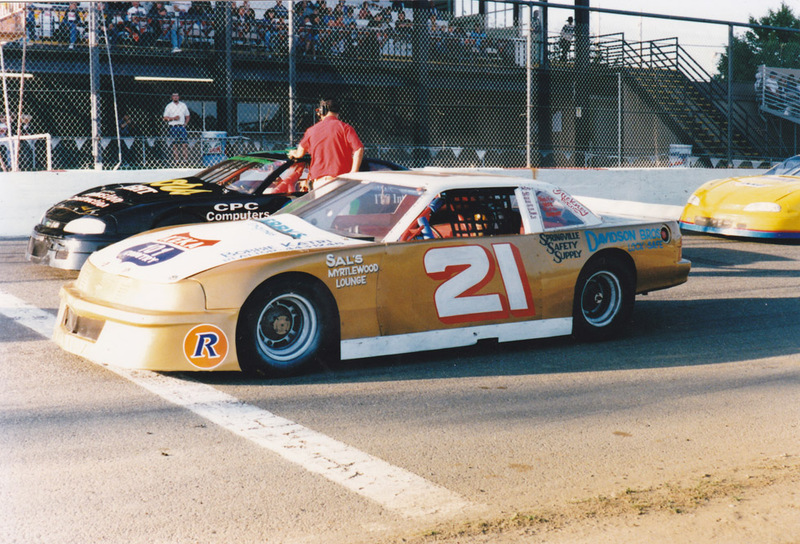 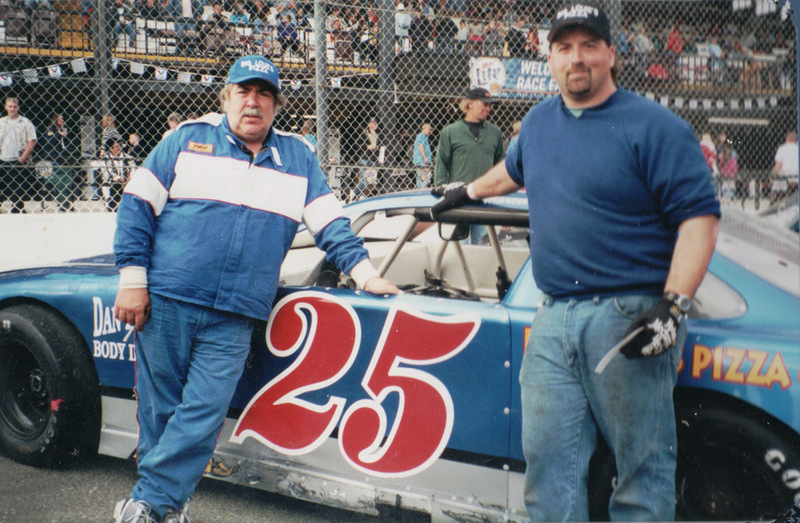 In his later years Hank no longer raced in the local Sportsman points races, opting instead for the Late Model Open Comp shows at RAR and other tracks, while running with the highly competitive northern California tours like NOR CAL, TRI-STATE and the North State Challenge Series, finishing as high as 4th in the standings in 2003 at the age of 70. 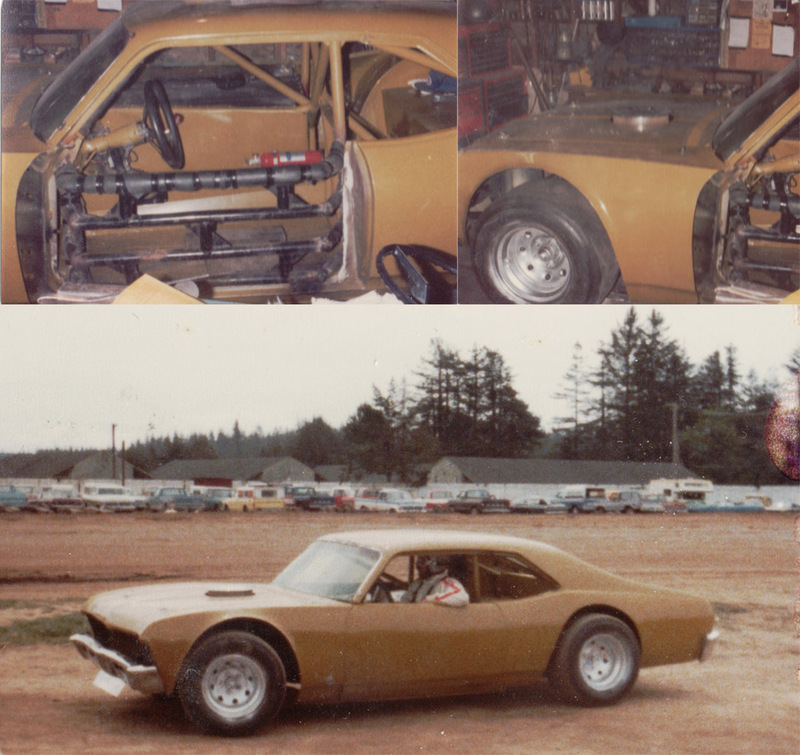 And he did all this with just a couple local sponsors and without a mechanic in charge of the car, unlike many of the other teams. 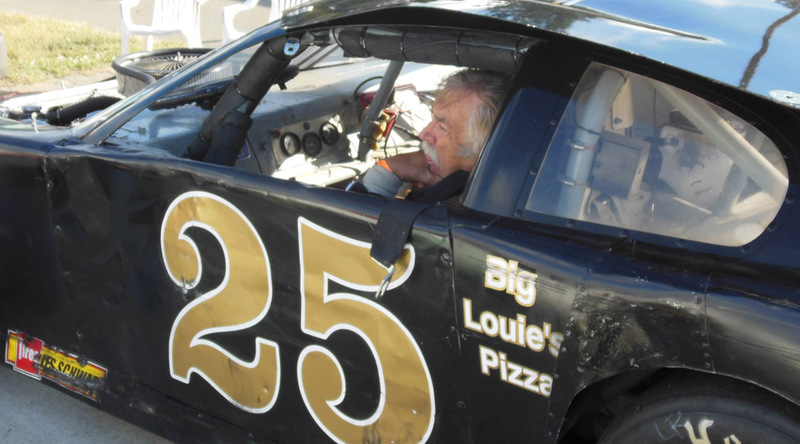 In late 2007 Hank was diagnosed with lung cancer. 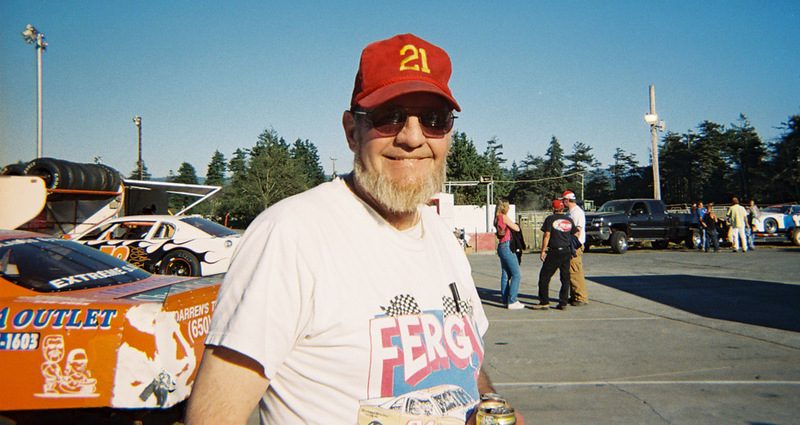 While in the Hospital in Crescent City, Hank was watching NASCAR races on TV with the sound down. 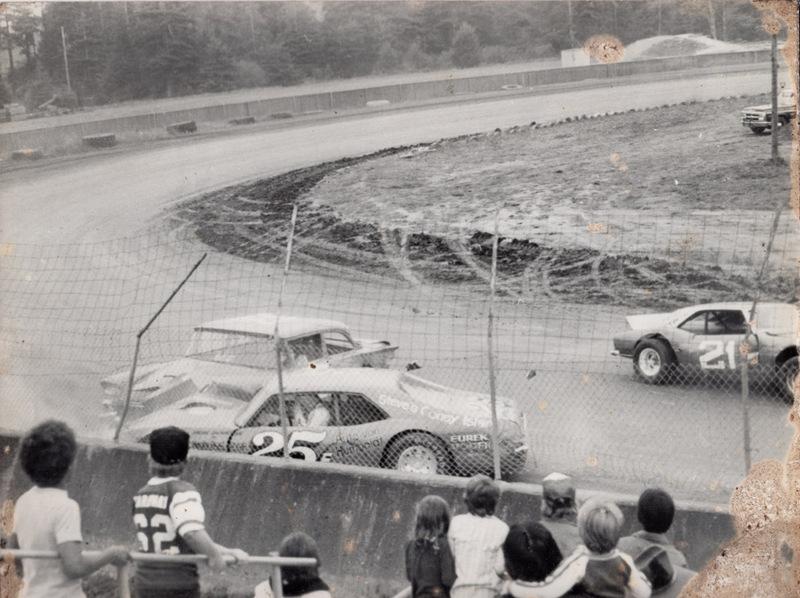 “He did not like Darrell Waltrip. 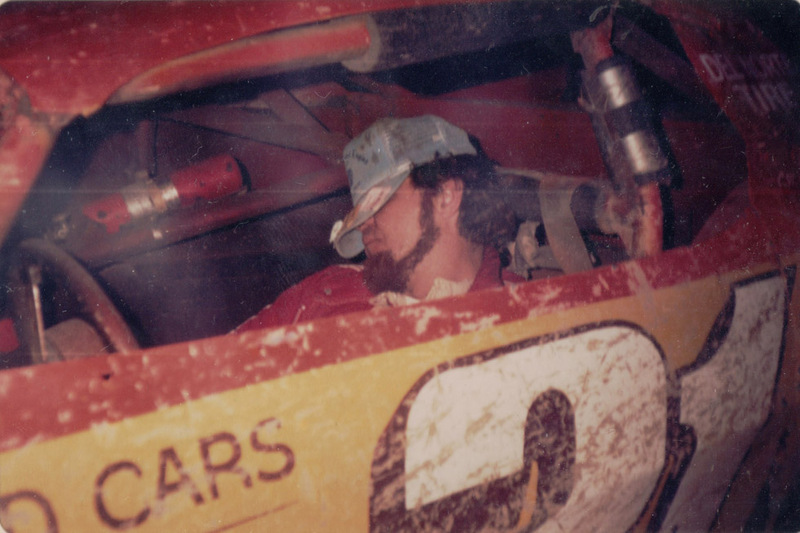 He would watch all the races with the sound down” Delores says. 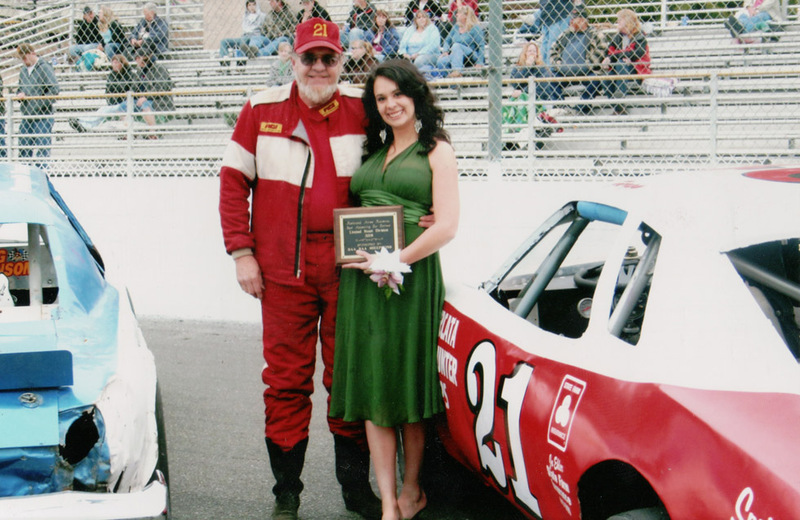 “While in the hospital they stopped his heart three times to get it beating correctly- the nurse said it was going from zero to a hundred in no time and I said ‘give me a break- he’s a race car driver, what do you think? 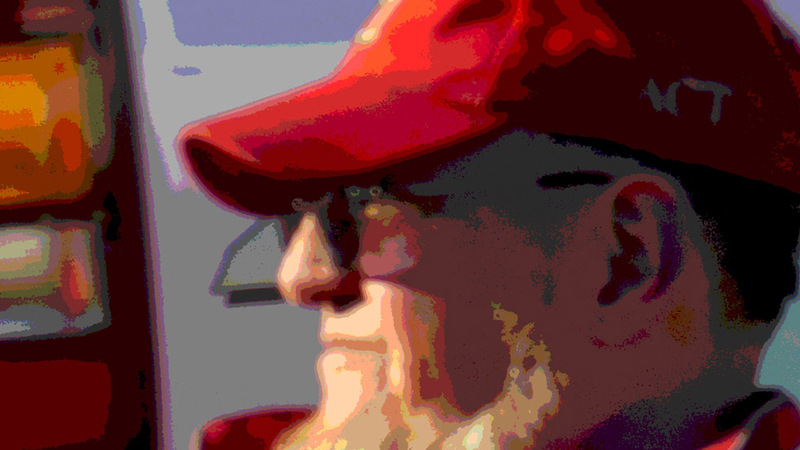 !‘.” Hank would eventually go home to Klamath, spending his final days with his family and friends. 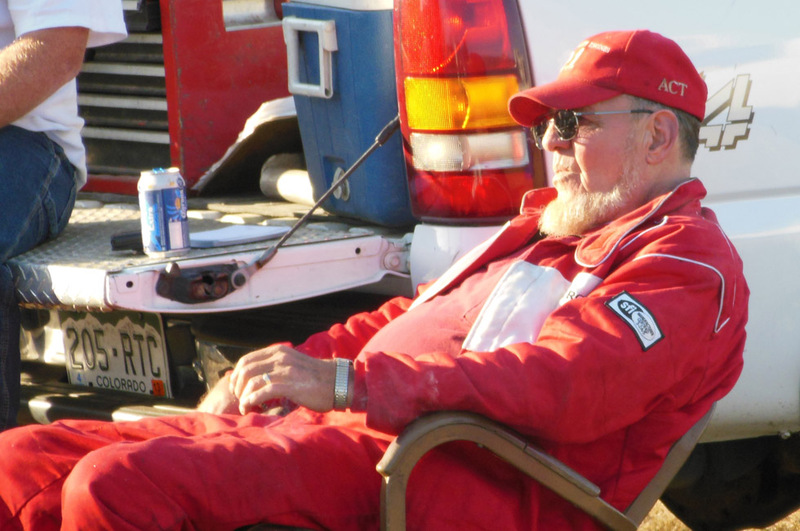 Hank at the end of the 2007 Fall Spectacular, his final race at Redwood Acres, sitting in the back of his hauler, an old ambulance he got from a mill in Orick for a dollar. 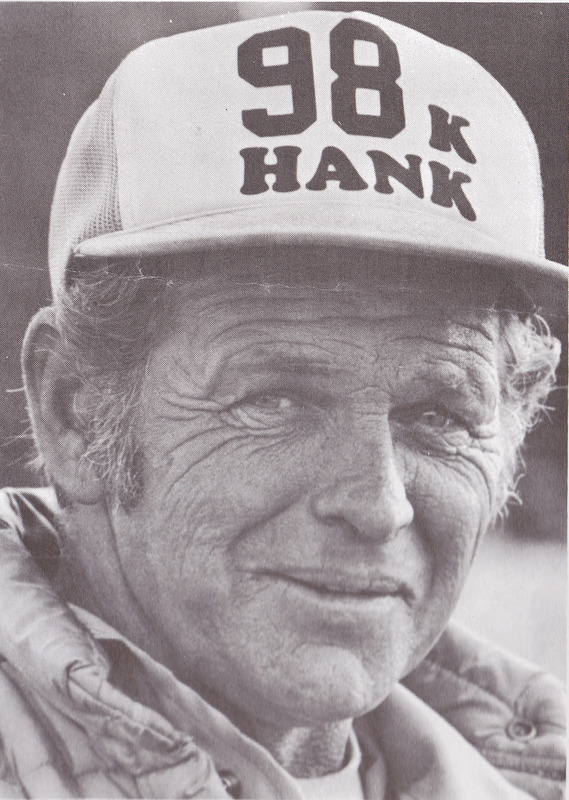 Hank passed away on February 28th, 2008, at the age of 74. 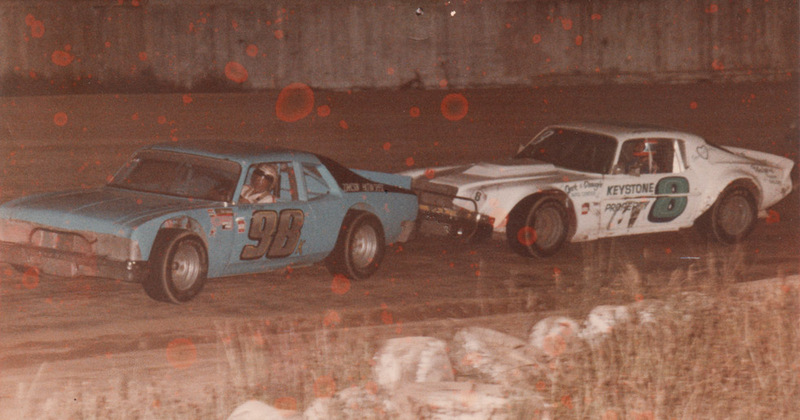 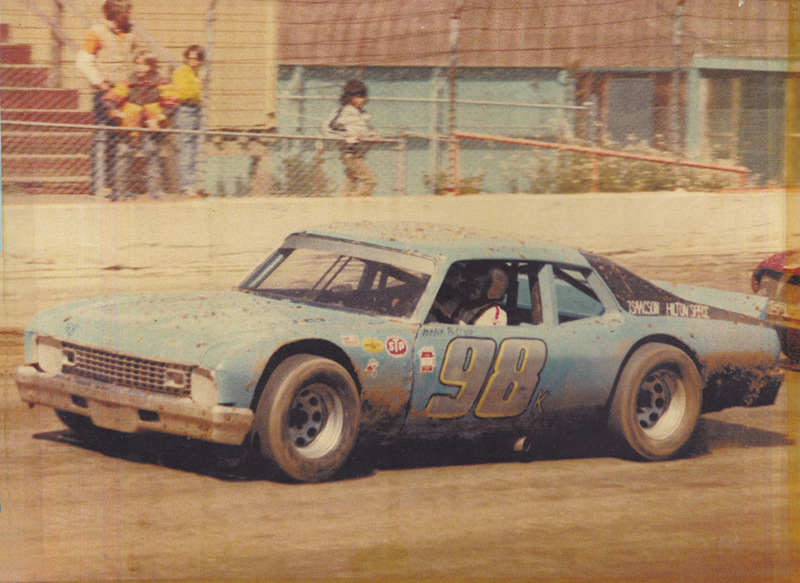 A few months later when the season was starting again at Redwood Acres, the #98 was driven again at the track in a memorial lap by Hank’s son, Frank Billy. 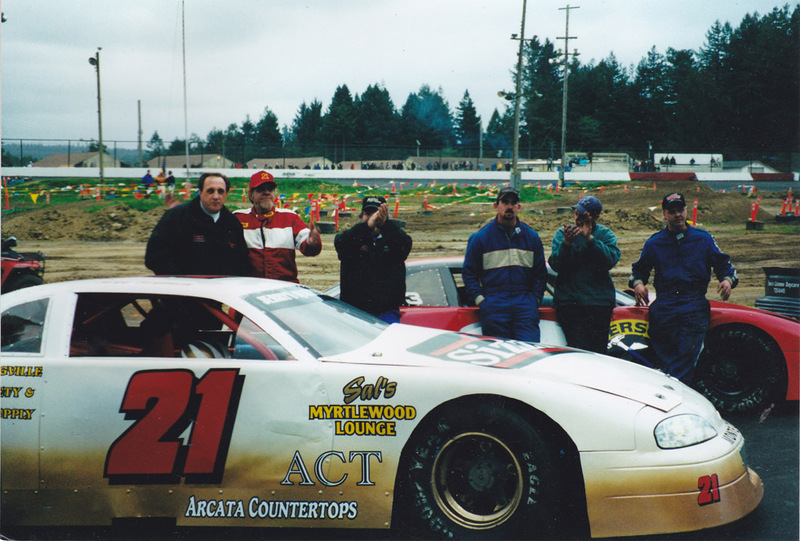 Later in the season local Sportsman division driver Romeo Venza raced the car and afterward in the pits was telling people how great the car handled. 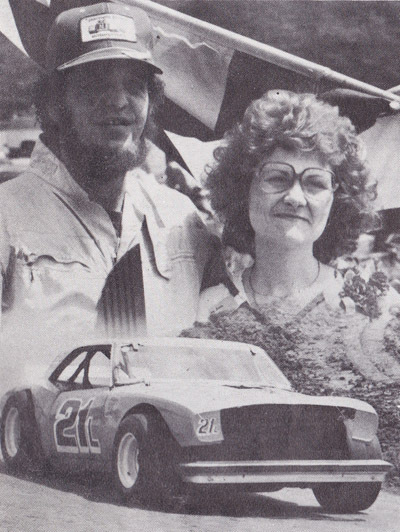 Special thanks to Delores Hilton for her generosity in opening up the scrapbooks and old programs, and for sharing her memories both colorful and personal, and also for sharing an attention to detail in nailing down the history the best we could. 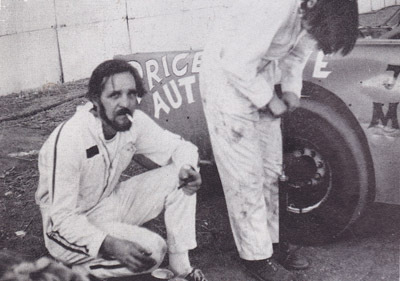 I had spoken to Hank in the pits after races about getting to hear his stories and see his old photos and his reply was “I’m in the book”. 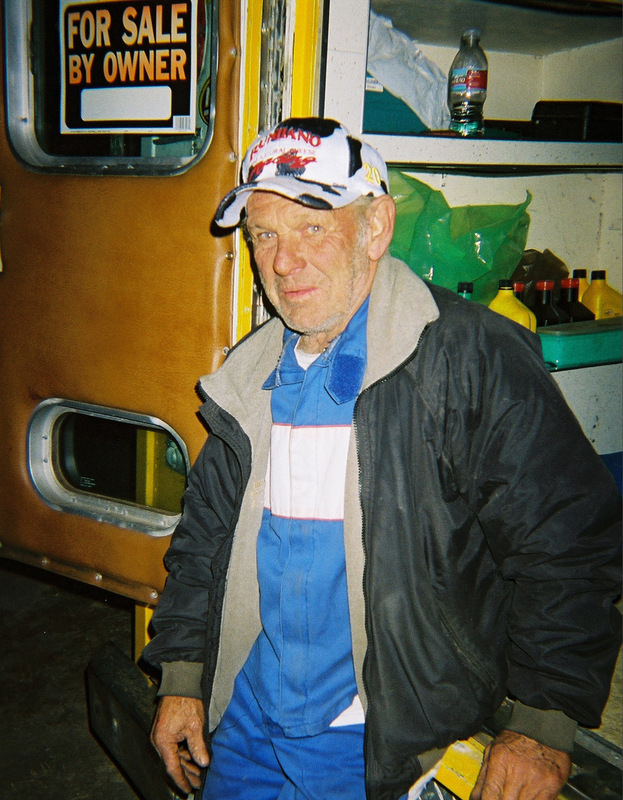 I had always regretted being too shy to take him up on his offer. 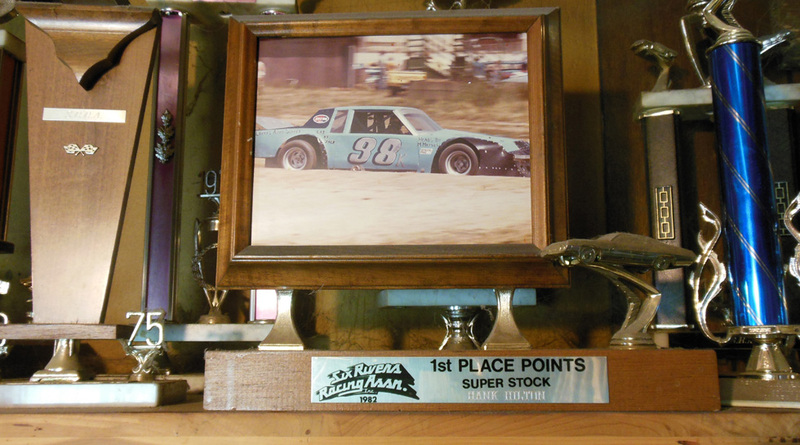 I think I needed a project like this, a place for the photos and stories to go, and after several years I finally found it, and Delores made it even better than I had imagined. 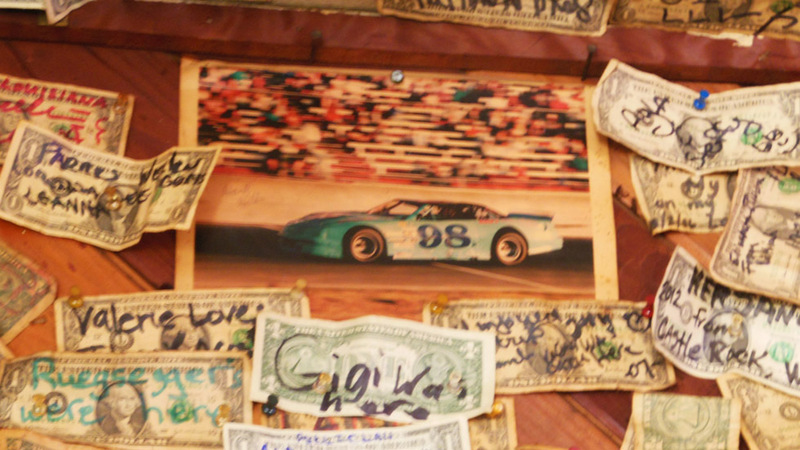 At his favorite hang out, The Country Club Bar & Grill in Klamath CA, 18 years of customer signed dollars over the bar surround a photo of the #98 of Hank Hilton.